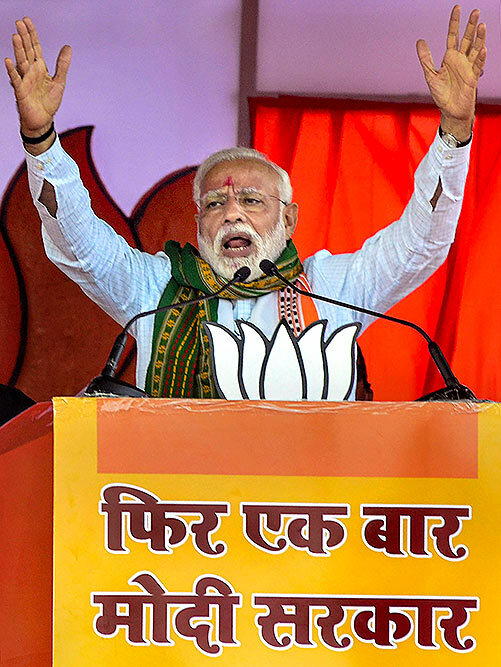 Prime Minister Narendra Modi addresses an election rally ahead of the 2019 Lok Sabha polls, in Lohardaga district of Jharkhand. 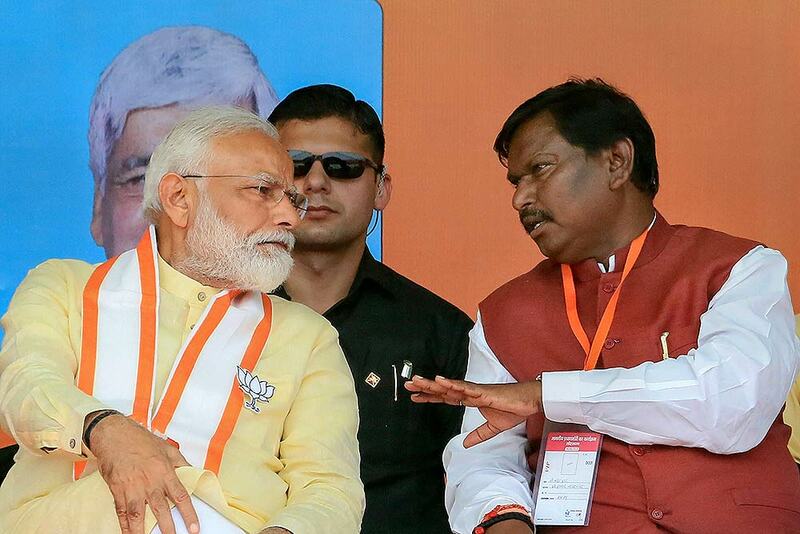 Prime Minister Narendra Modi is felicitated by Jharkhand Chief Minister Raghubar Das as former chief minister Arjun Munda looks on, during an election rally ahead of the 2019 Lok Sabha polls, in Lohardaga district of Jharkhand. 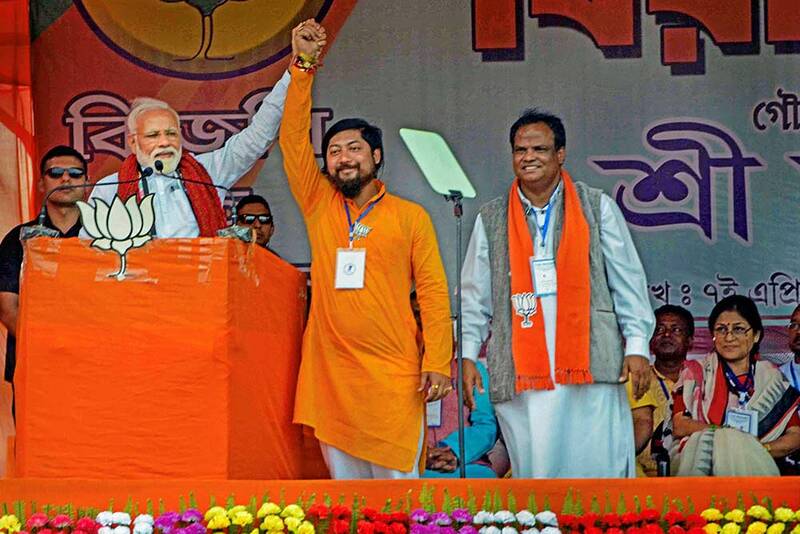 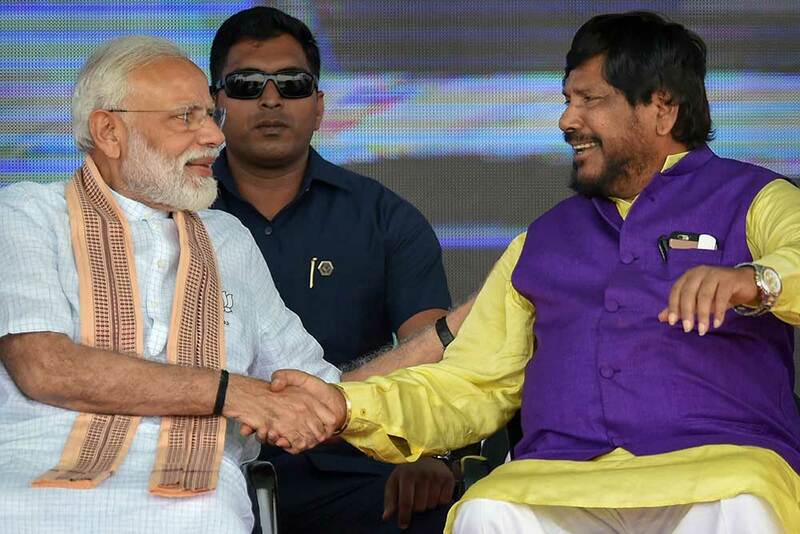 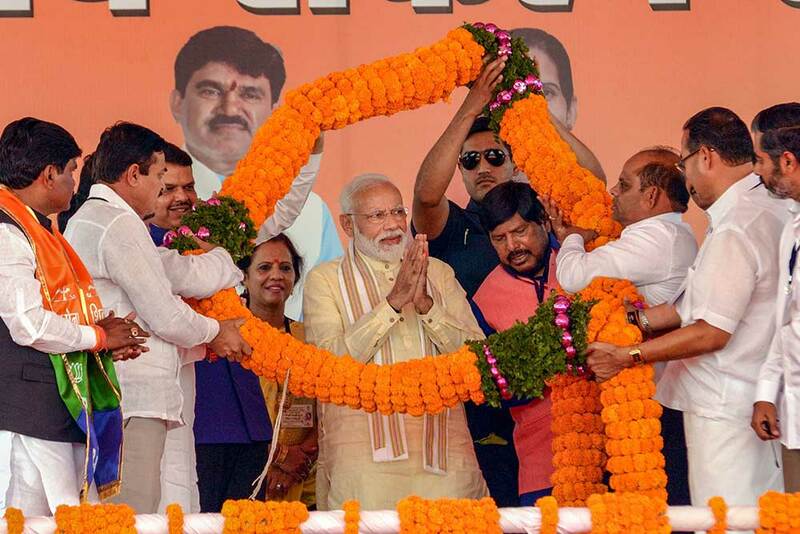 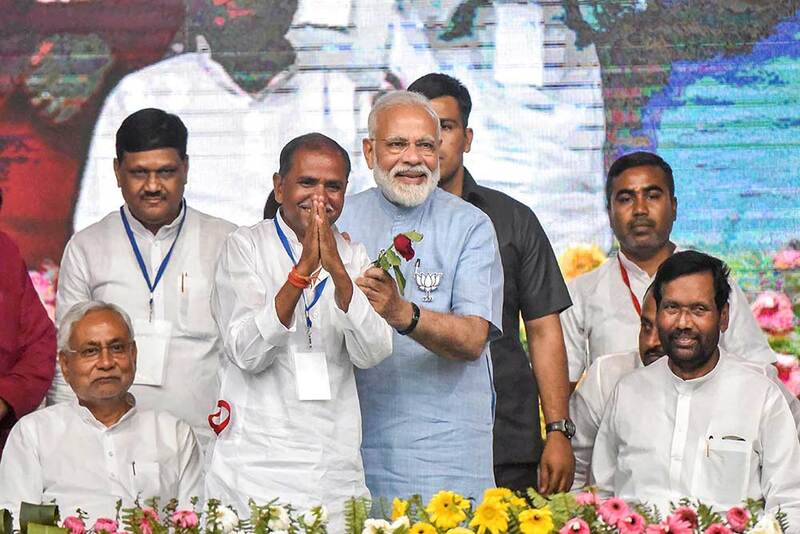 Prime Minister Narendra Modi and former Jharkhand chief minister Arjun Munda during an election rally ahead of the 2019 Lok Sabha polls, in Lohardaga district of Jharkhand. 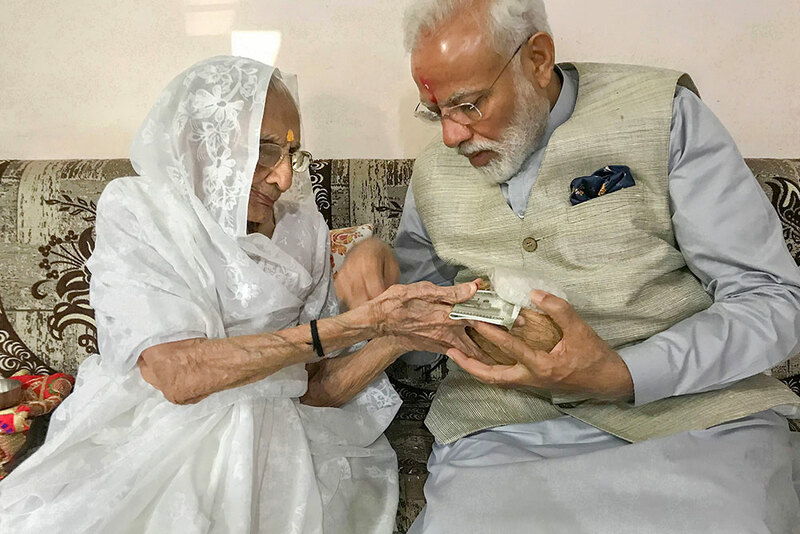 Prime Minister Narendra Modi seeks blessings of his mother Heeraben Modi on day of polling for the third phase of the general elections, in Gandhinagar. 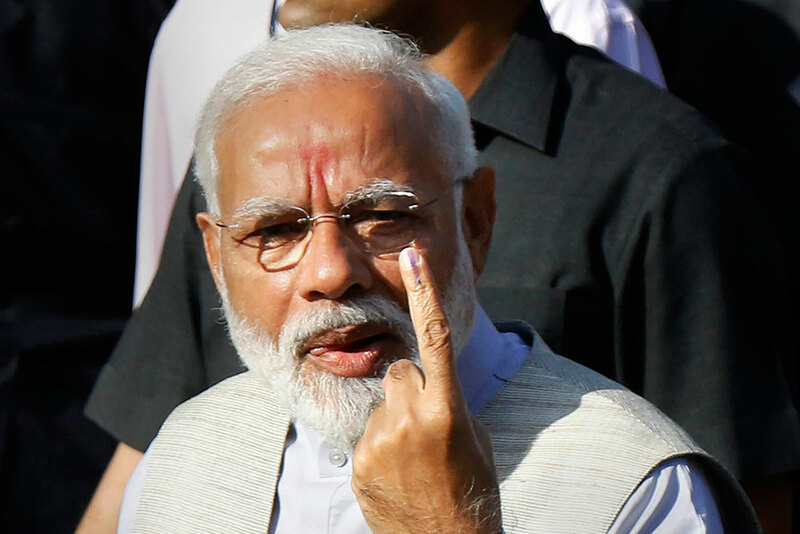 Modi met his mother at her residence near here before going to cast his vote at a polling booth in Ranip locality in Gujarat. 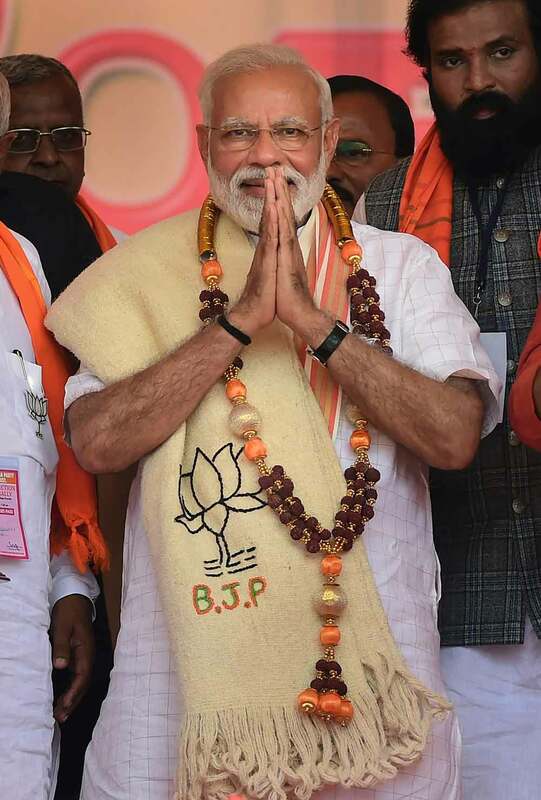 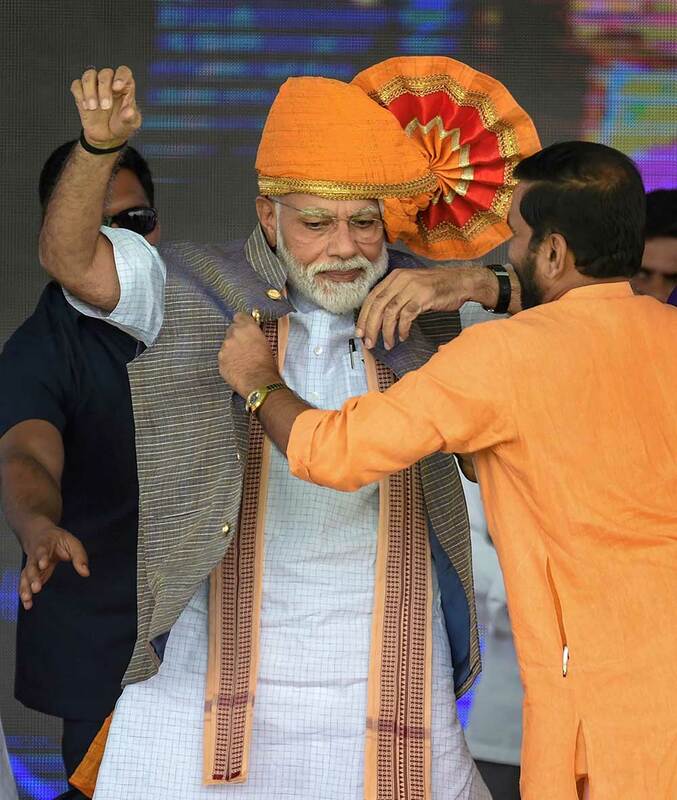 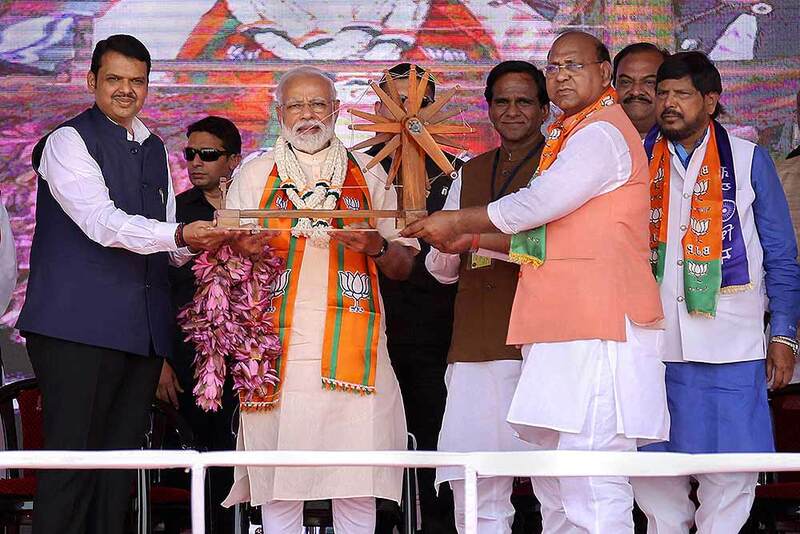 Prime Minister Narendra Modi is being felicitated at a rally ahead of the Lok Sabha elections, at Akluj, in Solapur. 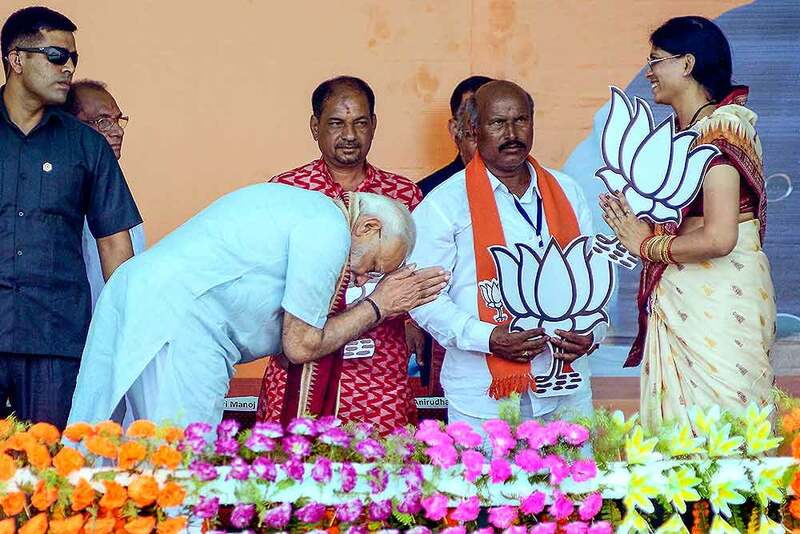 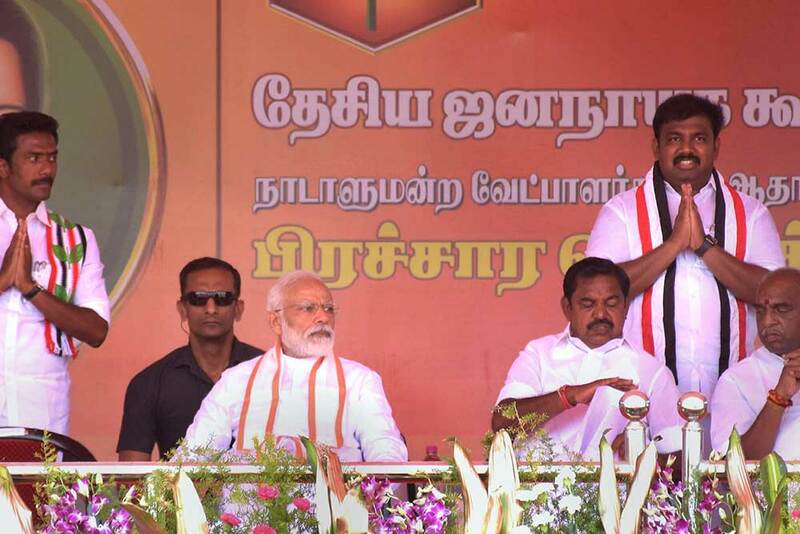 Prime Minister Narendra Modi with Tamil Nadu chief minister Edapadi Palanisamy and other leaders at an election campaign rally for the Lok Sabha elections, in Andipatti. 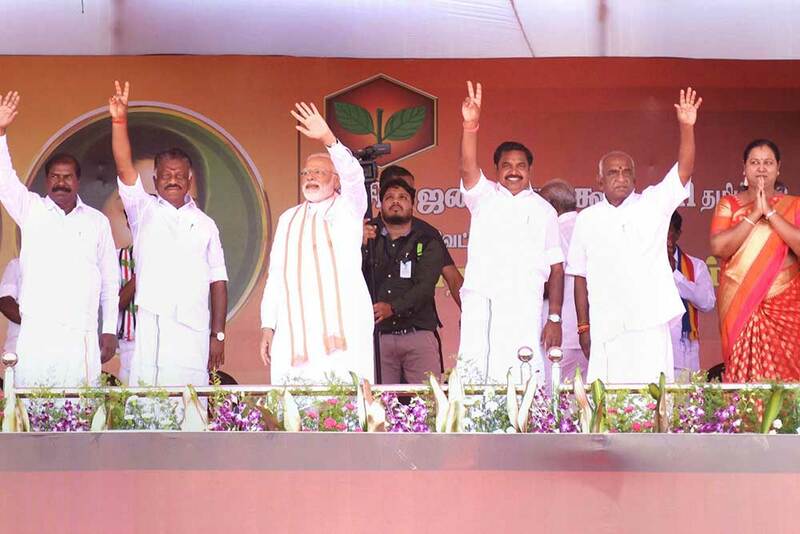 Prime Minister Narendra Modi waves along with Tamil Nadu chief minister Edapadi Palanisamy, O. Panneerselvam and other leaders at an election campaign rally for the Lok Sabha elections, in Andipatti. 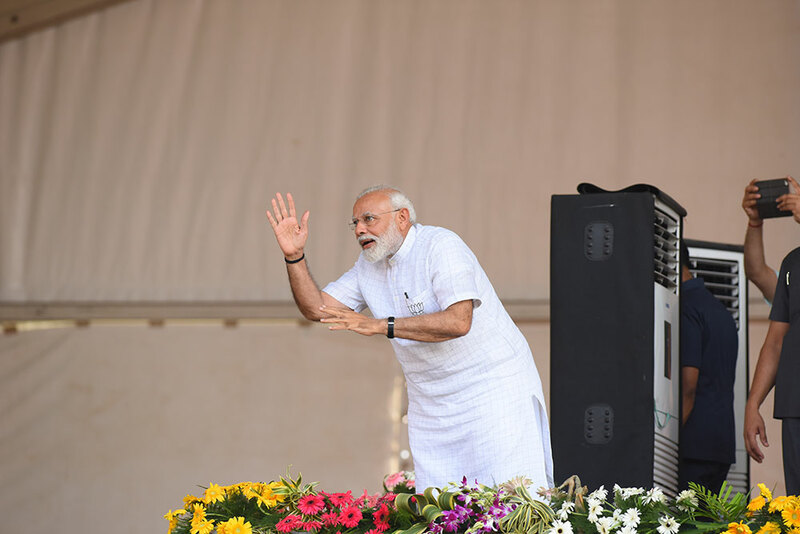 Prime Minister Narendra Modi during an election rally, ahead of Lok Sabha polls, at Chitradurga. 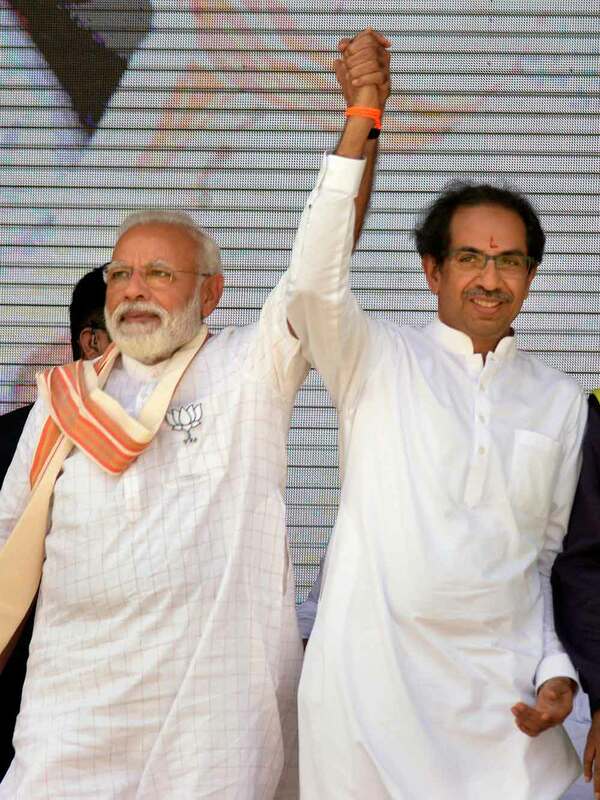 Prime Minister Narendra Modi with Shiv Sena chief Uddhav Thackeray at an election campaign rally in support of alliance candidates at Ausa in Latur district, Maharashtra. 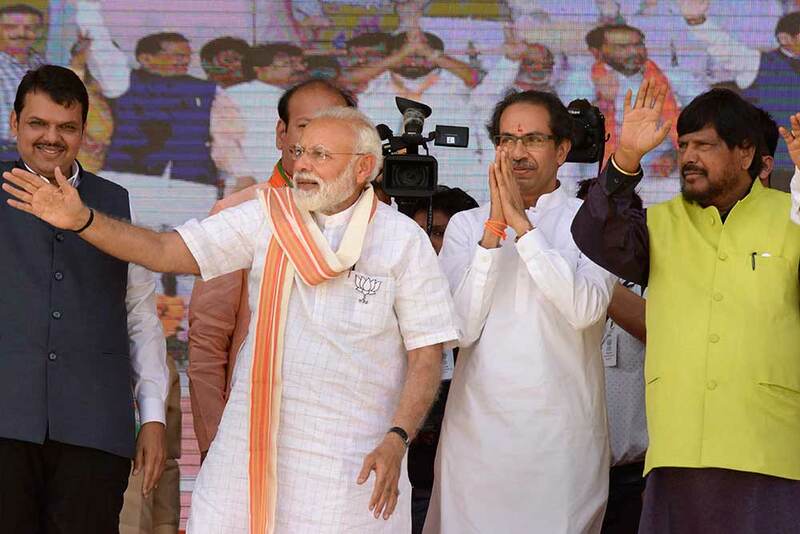 Prime Minister Narendra Modi, Shiv Sena chief Uddhav Thackeray, RPI leader Ramdas Athavale and Maharashtra CM Devendra Fadanvis (L) at an election campaign rally in support of alliance candidates at Ausa in Latur district, Maharashtra. 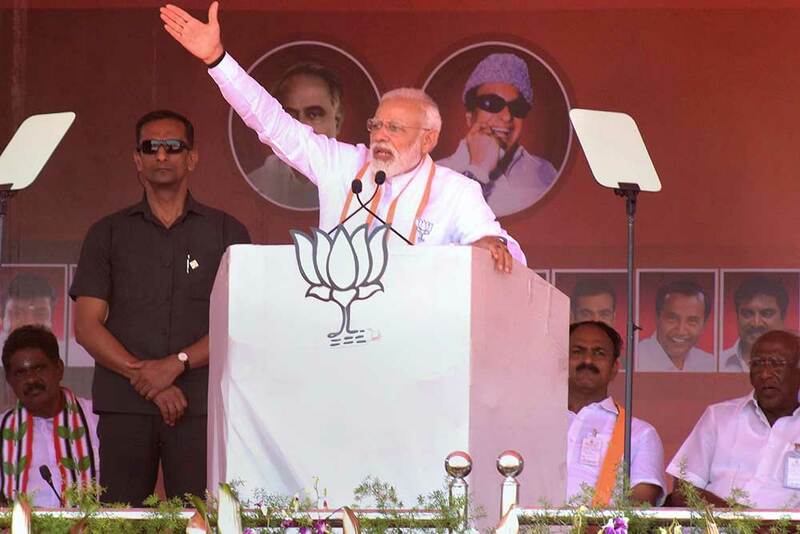 Prime Minister Narendra Modi addresses an election campaign rally in support of alliance candidates at Ausa in Latur district, Maharashtra. 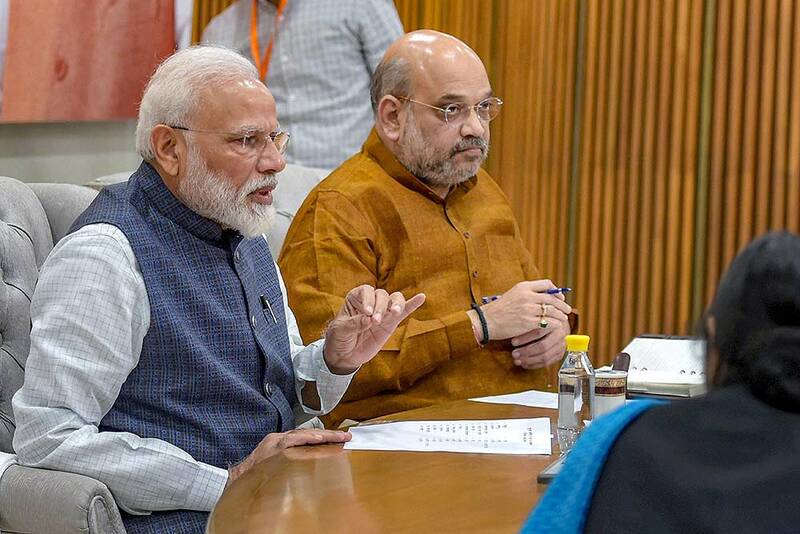 Prime Minister Narendra Modi,left, with Bharatiya Janata Party (BJP) president Amit Shah listens to Indian Home Minister Rajnath Singh during the release BJP's manifesto for the upcoming general elections in New Delhi. 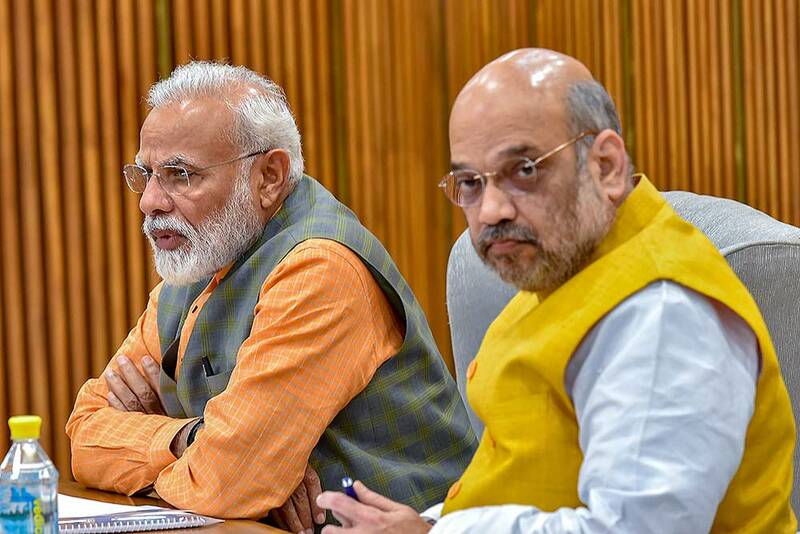 Prime Minister Narendra Modi, left, with Bharatiya Janata Party (BJP) president Amit Shah listen to Home Minister Rajnath Singh during the release BJP's manifesto for the upcoming general elections in New Delhi. 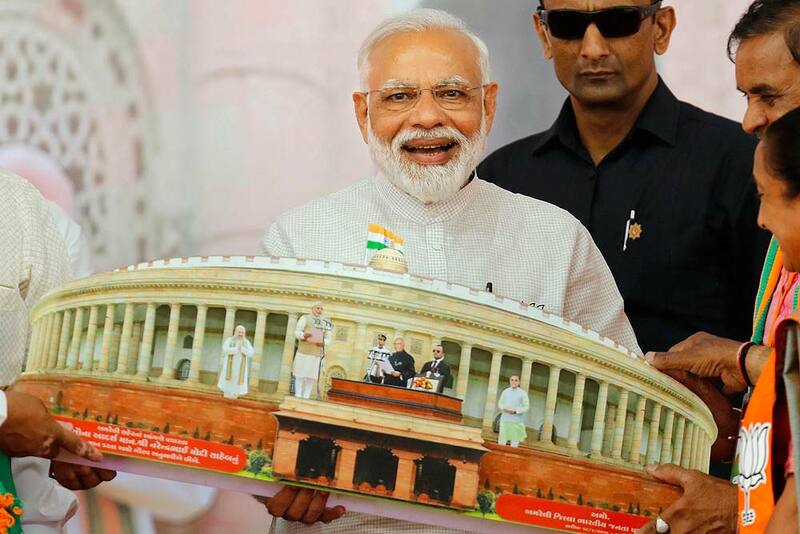 Prime Minister Narendra Modi, right, talks to Foreign Minister Susuhma Swaraj during the release BJP's manifesto for the upcoming general elections in New Delhi. 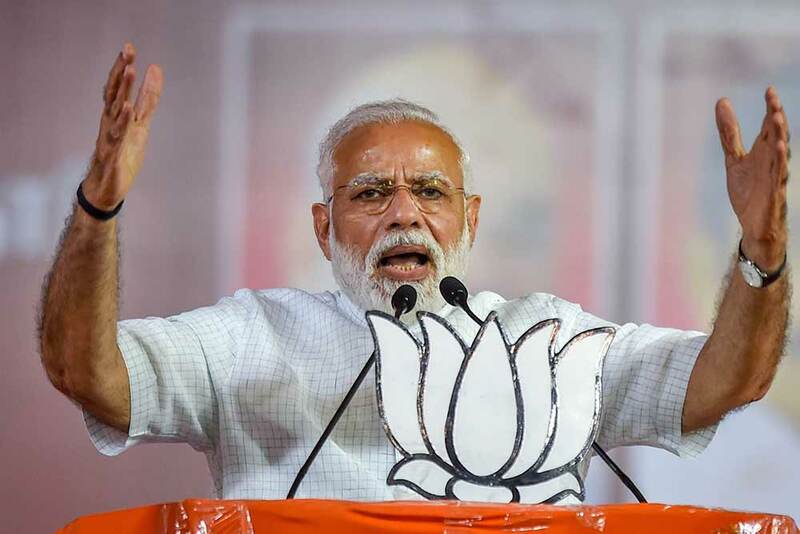 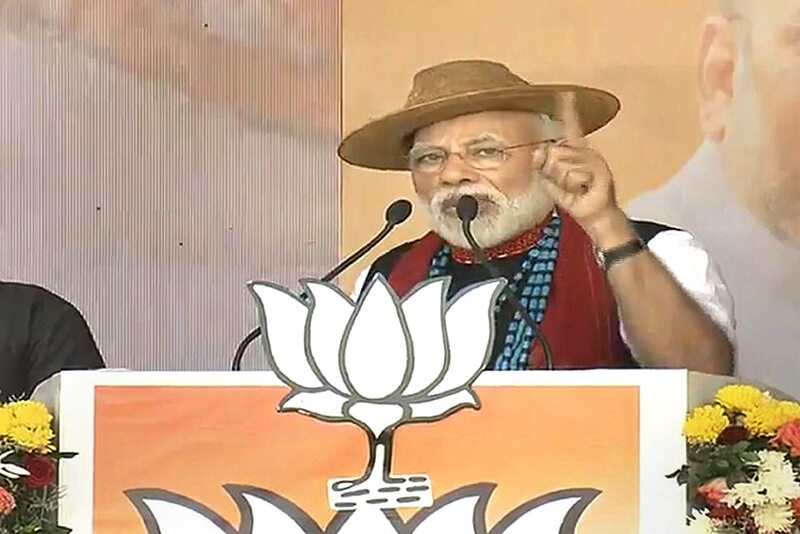 Prime Minister Narendra Modi addresses an election campaign rally in support of the BJP candidate, ahead of the Lok Sabha elections at Rash Mela Ground in Cooch Behar district of West Bengal. 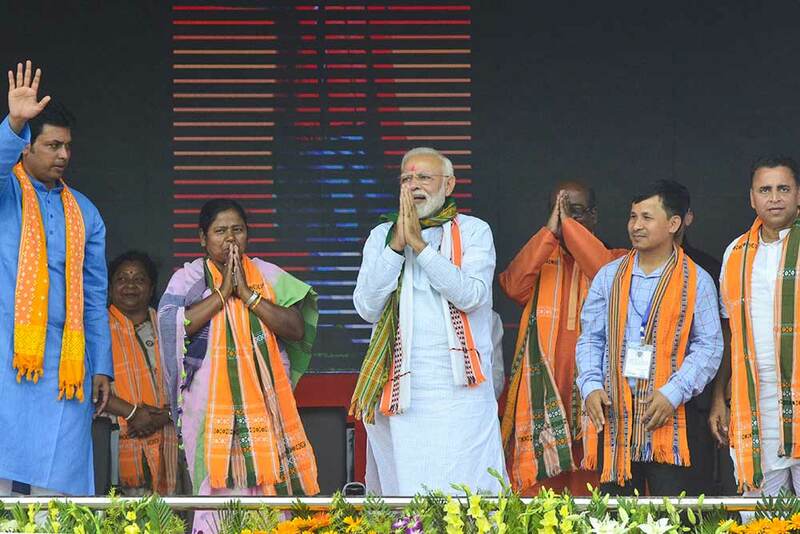 Prime Minister Narendra Modi with Tripura Chief Minister Biplab Deb and others during an election campaign rally for Lok Sabha polls, in Udaipur, Tripura. 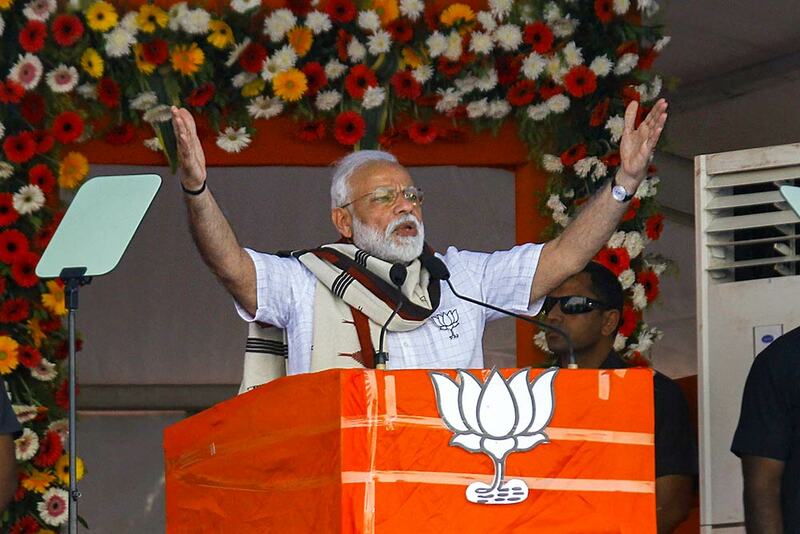 Prime Minister Narendra Modi addresses an election campaign rally for Lok Sabha polls, in Udaipur, Tripura. 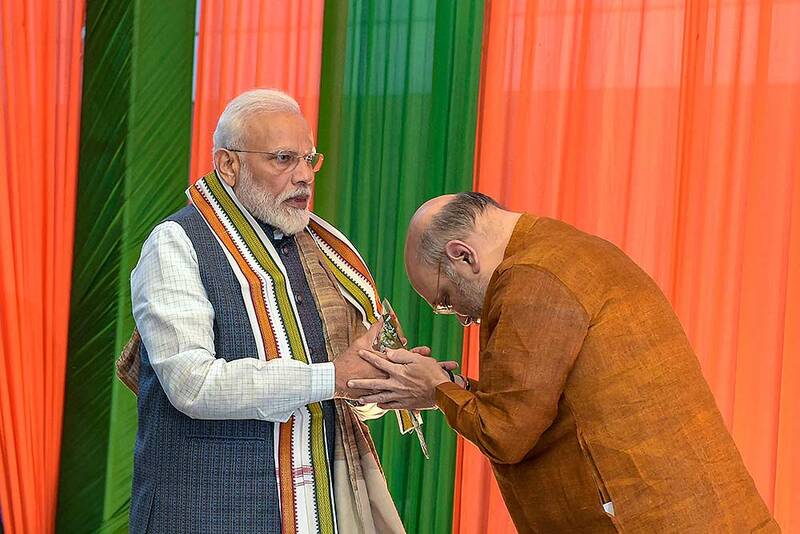 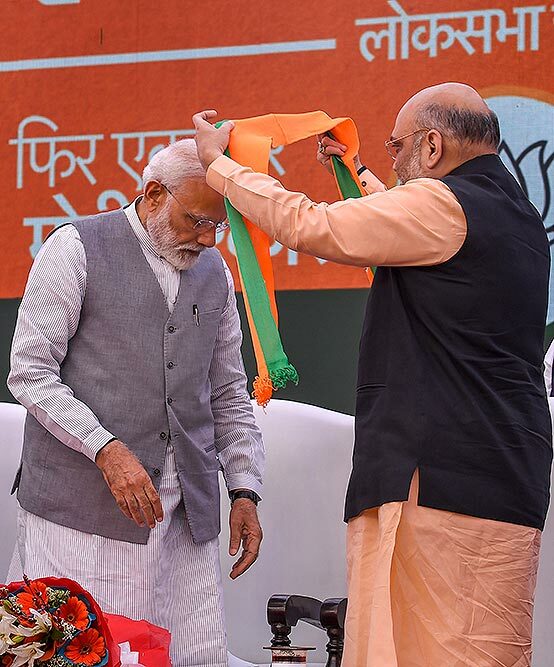 Prime Minister Narendra Modi is being felicitated by BJP President Amit Shah during the release of Bharatiya Janata Party's (BJP) manifesto (Sankalp Patra) for Lok Sabha elections 2019, in New Delhi. 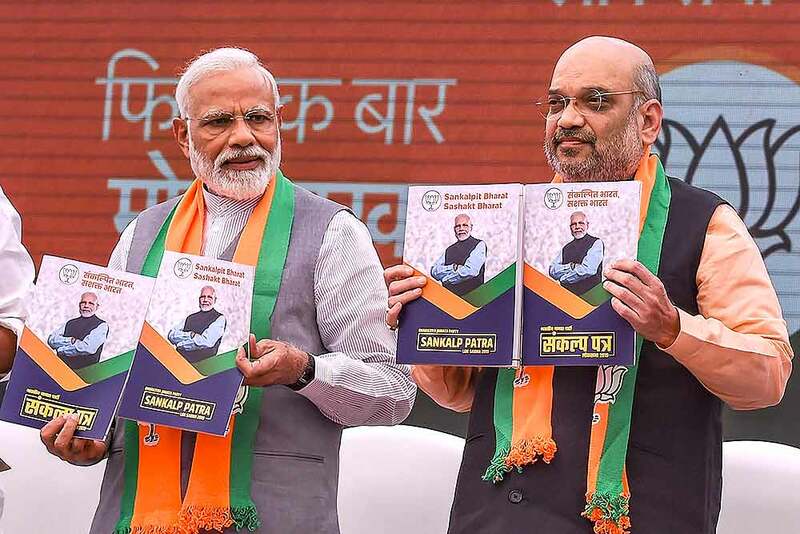 Prime Minister Narendra Modi and BJP President Amit Shah release Bharatiya Janata Party's (BJP) manifesto (Sankalp Patra) for Lok Sabha elections 2019, in New Delhi. 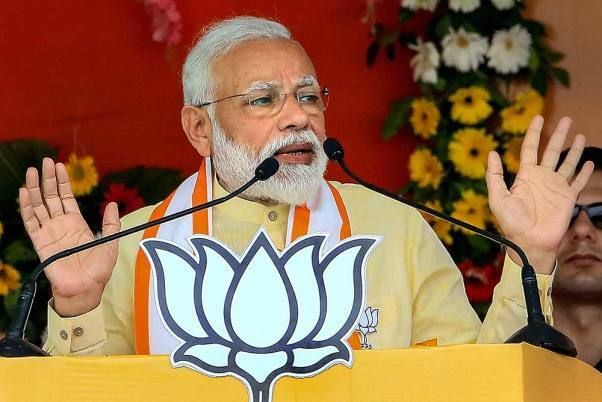 Prime Minister Narendra Modi speaks at the launch of BJP's poll manifesto for the upcoming general elections in New Delhi. 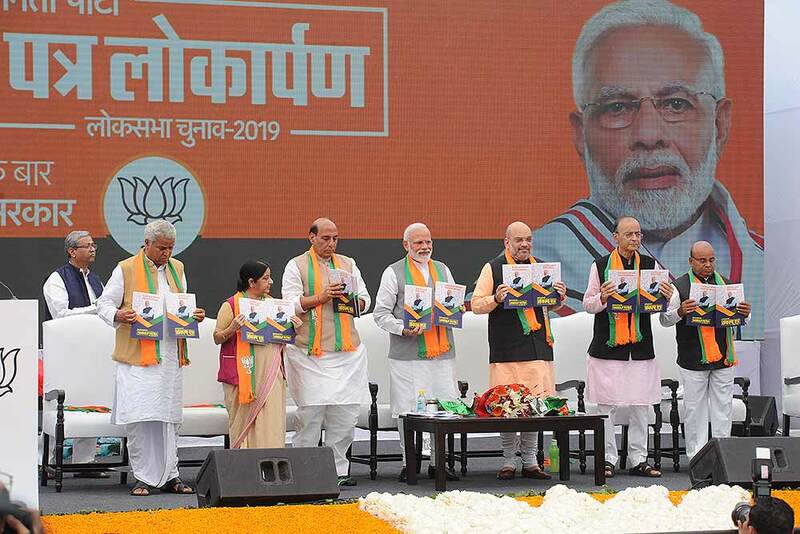 BJP leaders Sushma Swaraj, Rajnath Singh, Narendra Modi, Amit Shah while releasing party manifesto for 2019 lok sabha elections, in New Delhi. 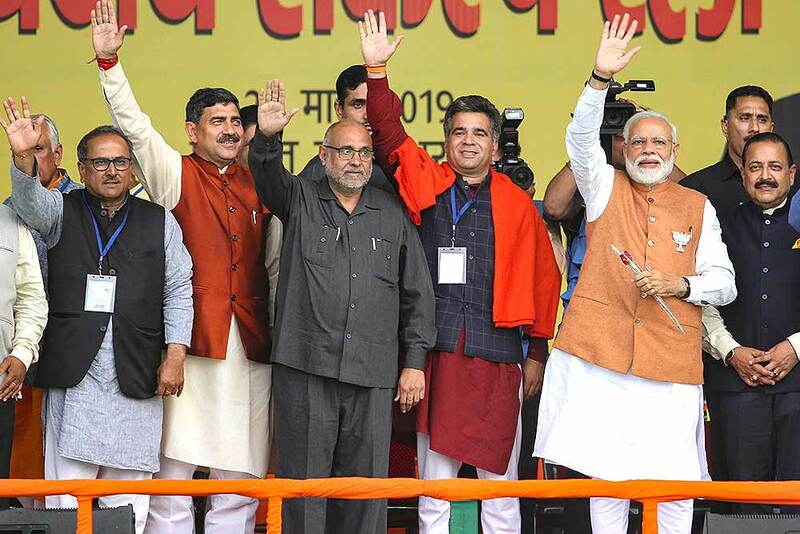 Prime Minister Narendra Modi with other BJP leaders at an election rally ahead of Lok Sabha polls, in Amroha. 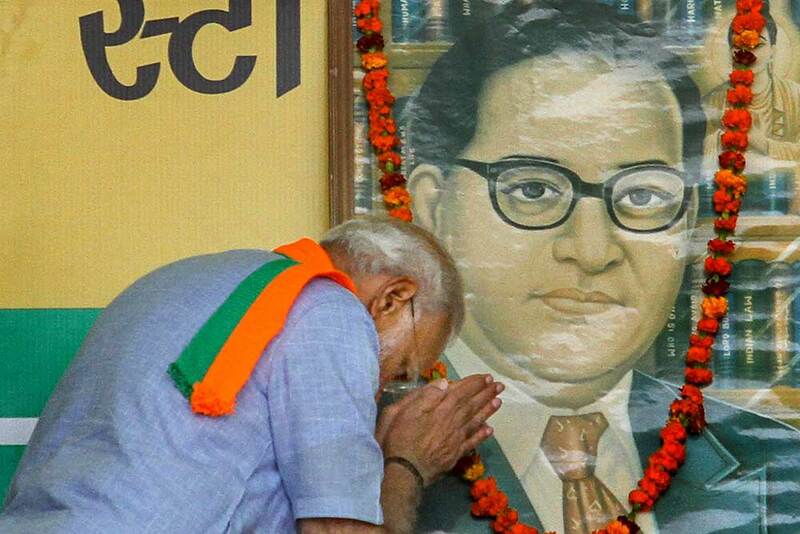 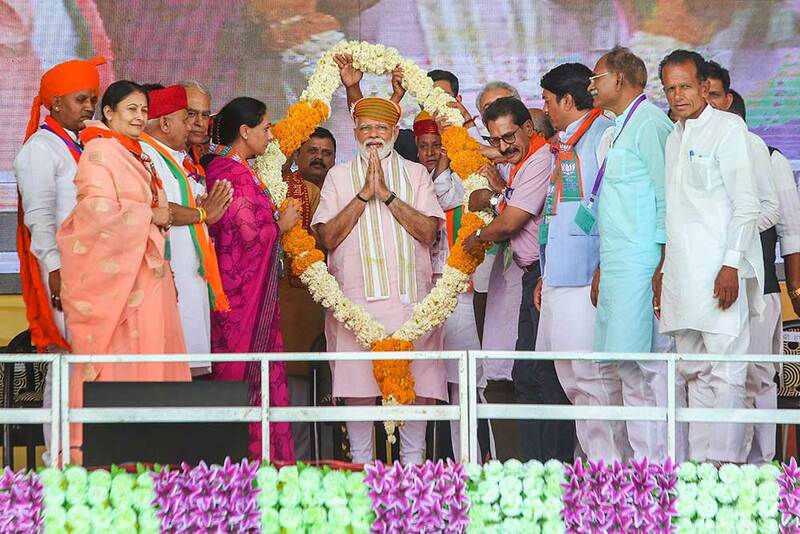 Prime Minister Narendra Modi during an election rally, for the upcoming Lok Sabha polls, in Gondia, Maharashtra. 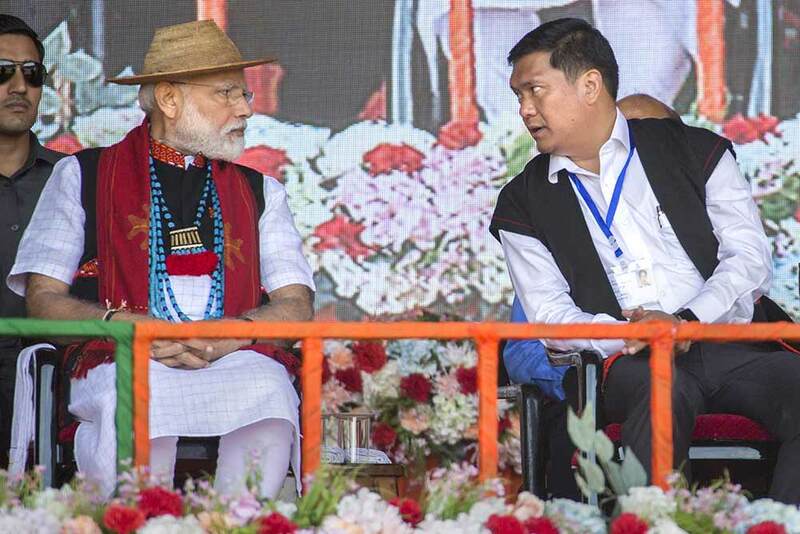 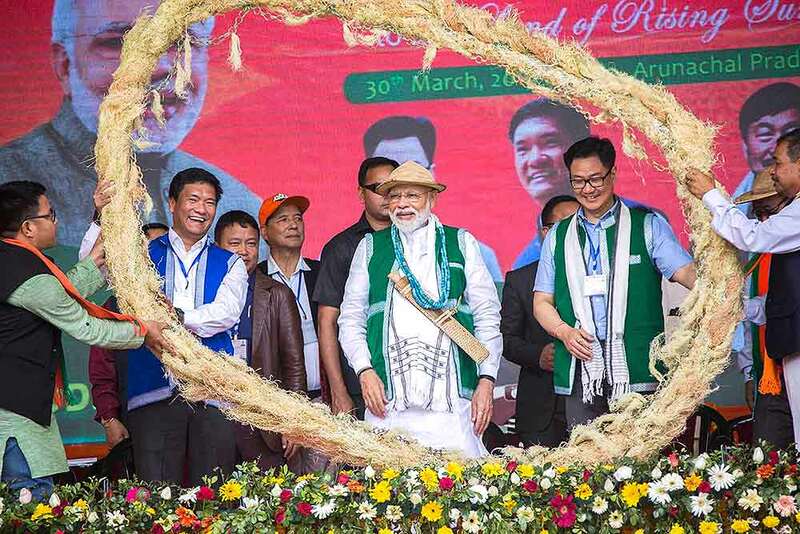 Prime Minister Narendra Modi with Arunachal Pradesh Chief Minister Pema Khandu during an election campaign rally for the Lok Sabha polls, at Pasighat, in East Siang district. 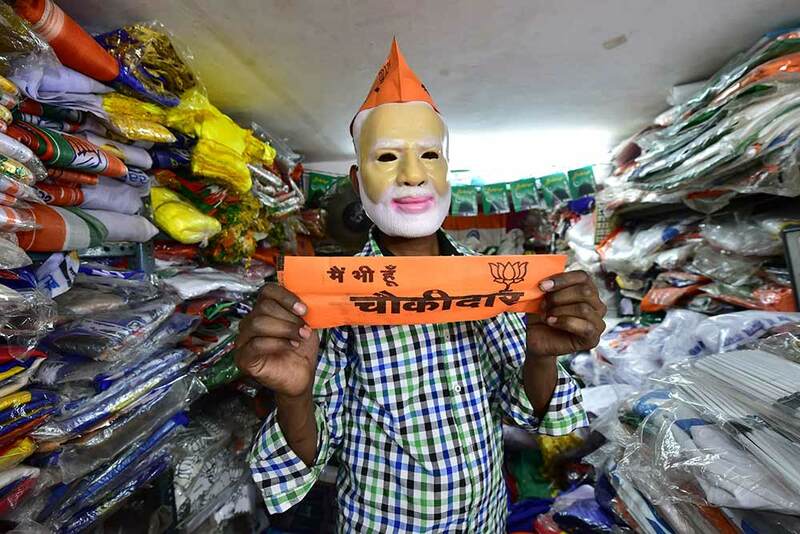 A salesman, donning a mask of Prime Minister Narendra Modi, displays a banner at a shop, ahead of the Lok Sabha polls, in New Delhi. 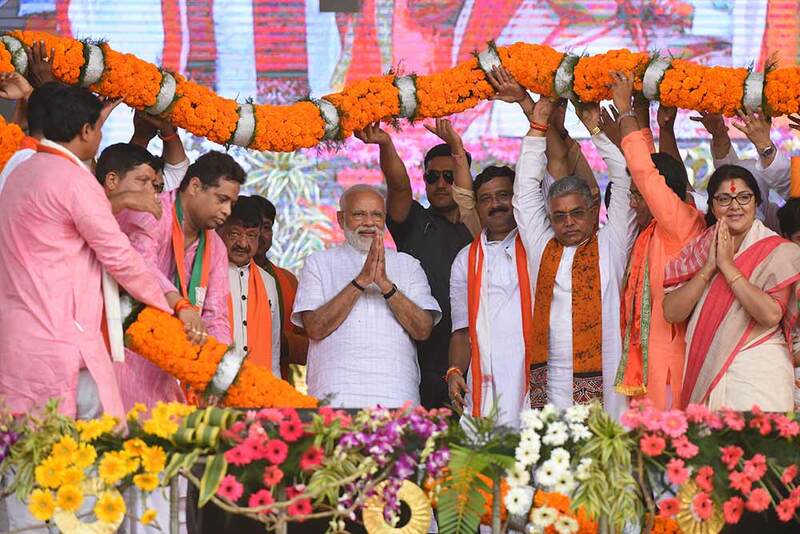 Prime Minister Narendra Modi during an election campaign in Kolkata. 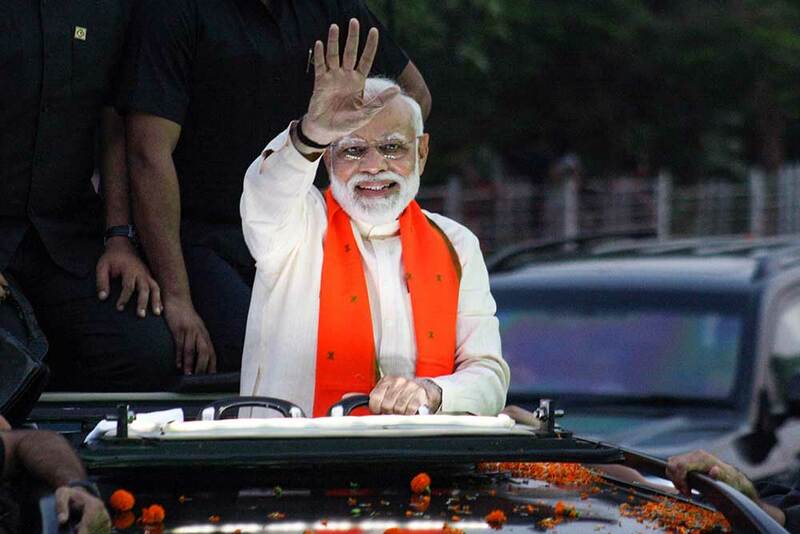 Prime Minister Narendra Modi waves at an election campaign in Kolkata. 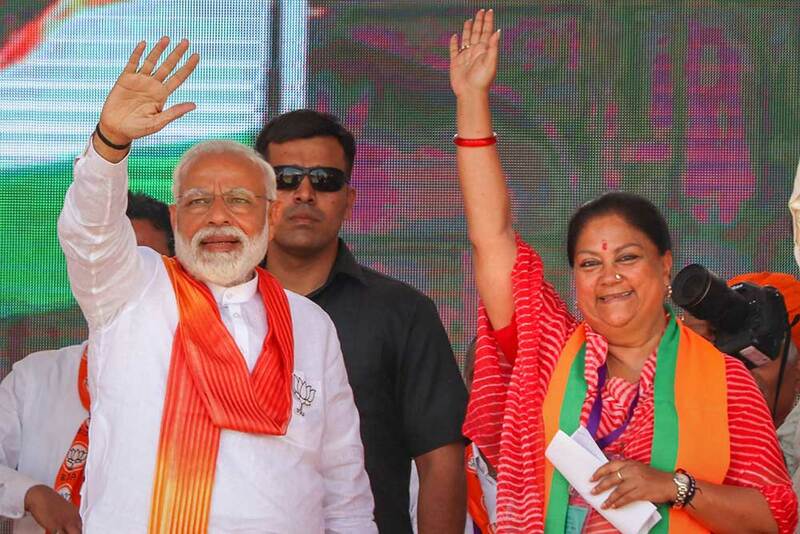 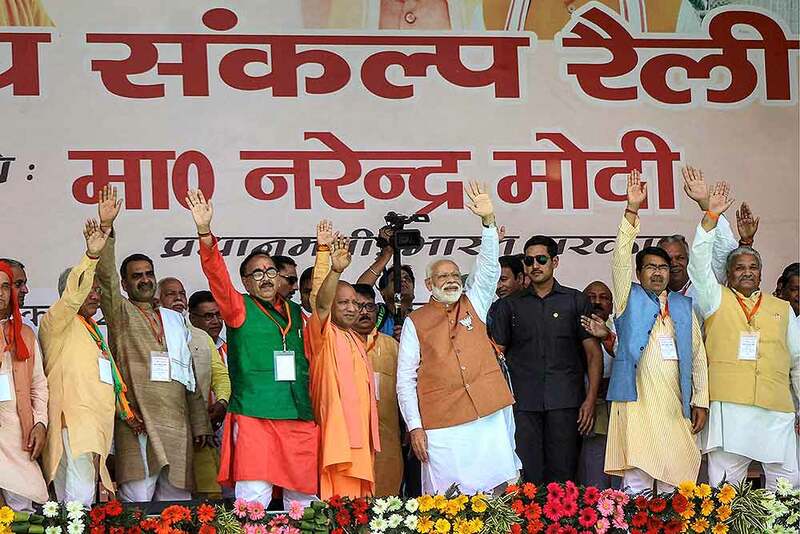 Prime Minister Narendra Modi along with other leaders wave at their supporters, during an election rally, ahead of Lok Sabha polls, in Jamui. 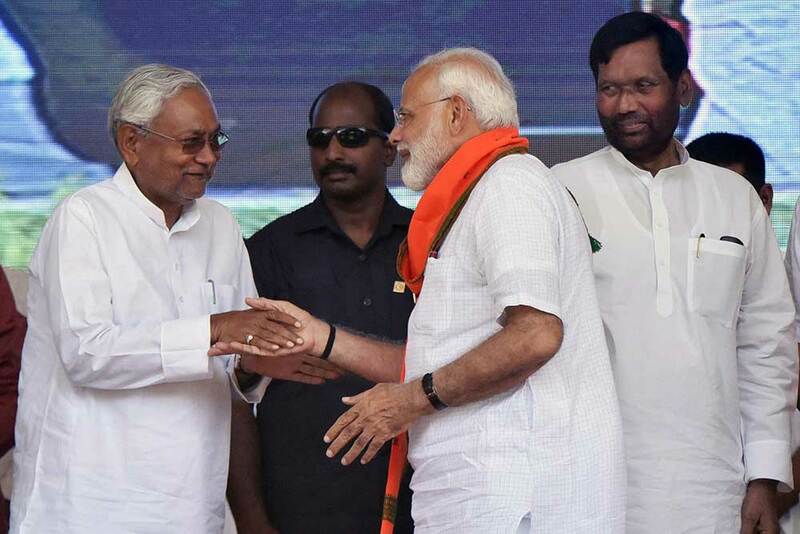 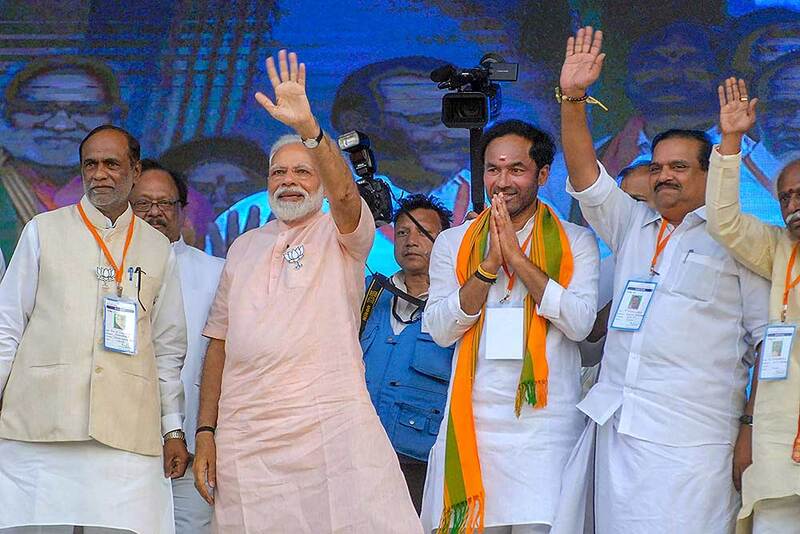 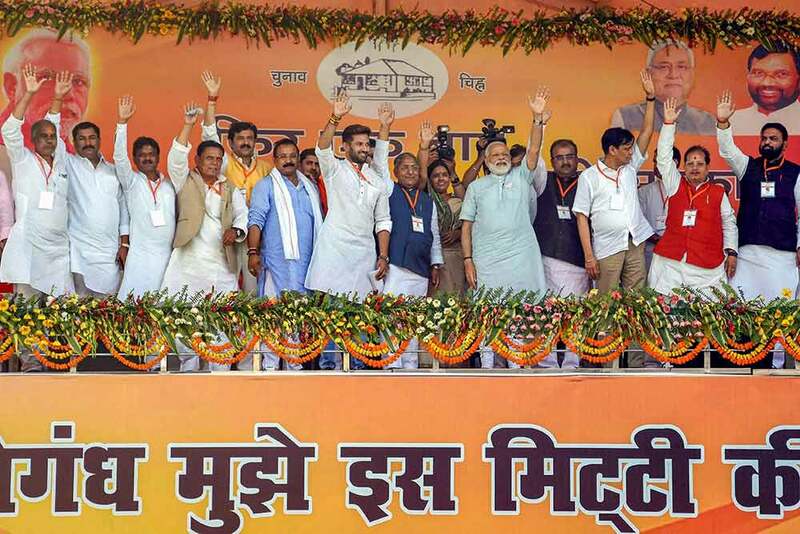 Prime Minister Narendra Modi with Bihar Chief Minister Nitish Kumar, Lok Janshakti Party (LJP) chief Ram Vilas Paswan and others, during an election rally, ahead of the Lok Sabha polls, in Gaya. 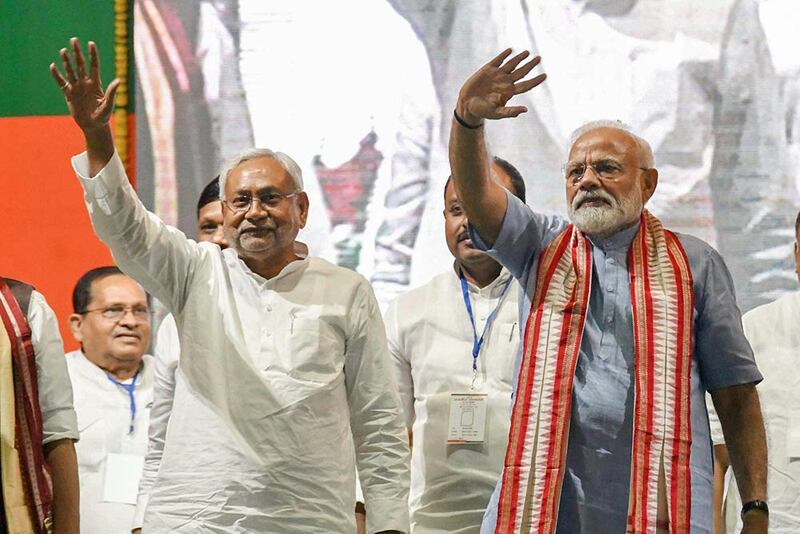 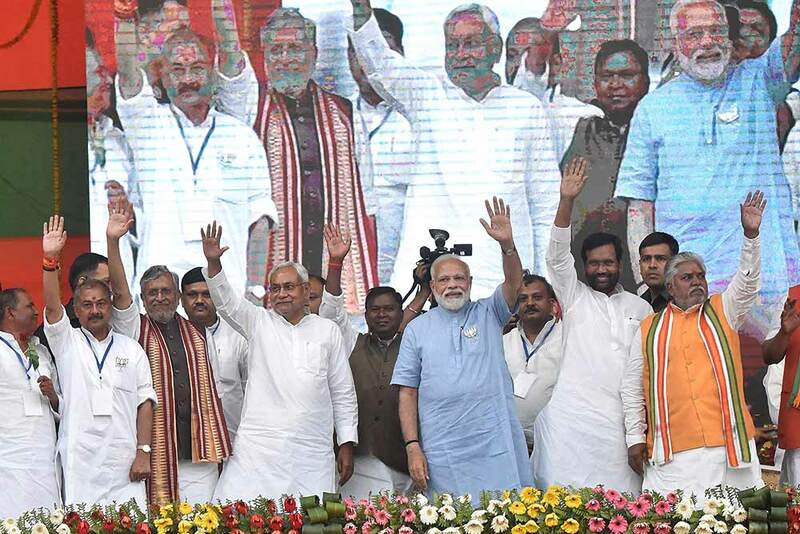 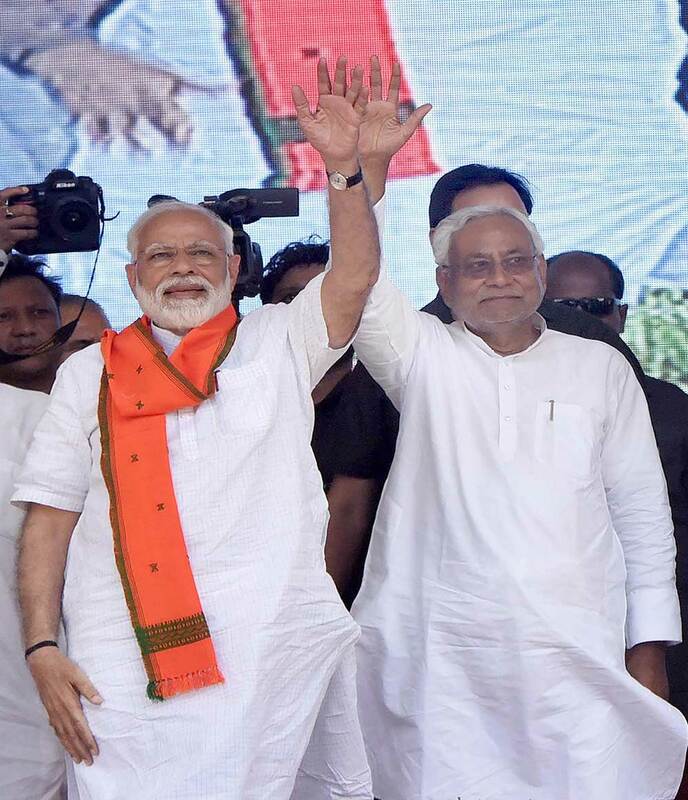 Prime Minister Narendra Modi with Bihar Chief Minister Nitish Kumar and others, during an election rally, ahead of the Lok Sabha polls, in Gaya. 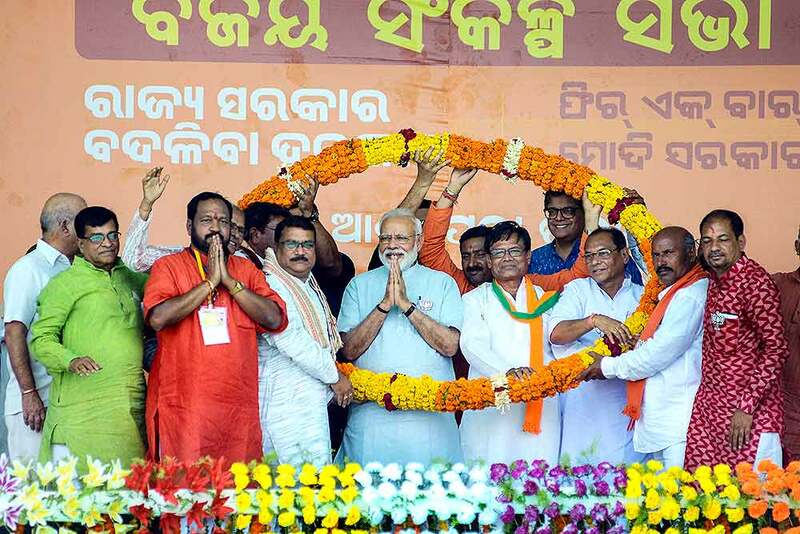 Prime Minister Narendra Modi garlanded by party workers in the presence of BJP Odisha President Basanta Kumar Panda during 'Vijay Sankalp Samavesh' public meeting ahead of Lok Sabha elections, at Bhawanipatna in Kalahandi. 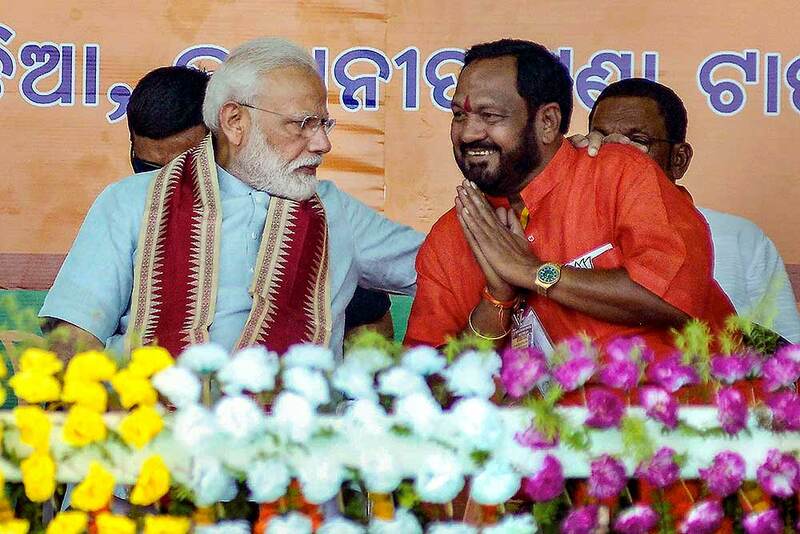 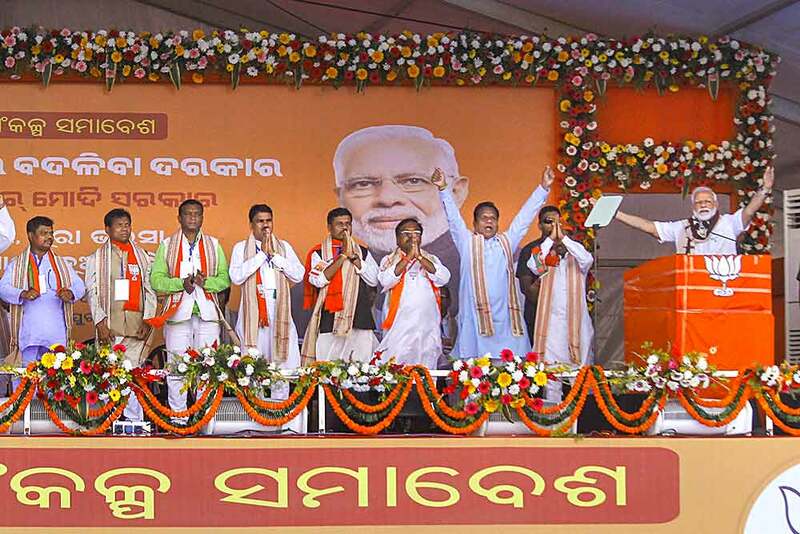 Prime Minister Narendra Modi with BJP Odisha President Basanta Kumar Panda during 'Vijay Sankalp Samavesh' public meeting ahead of Lok Sabha elections, at Bhawanipatna in Kalahandi. 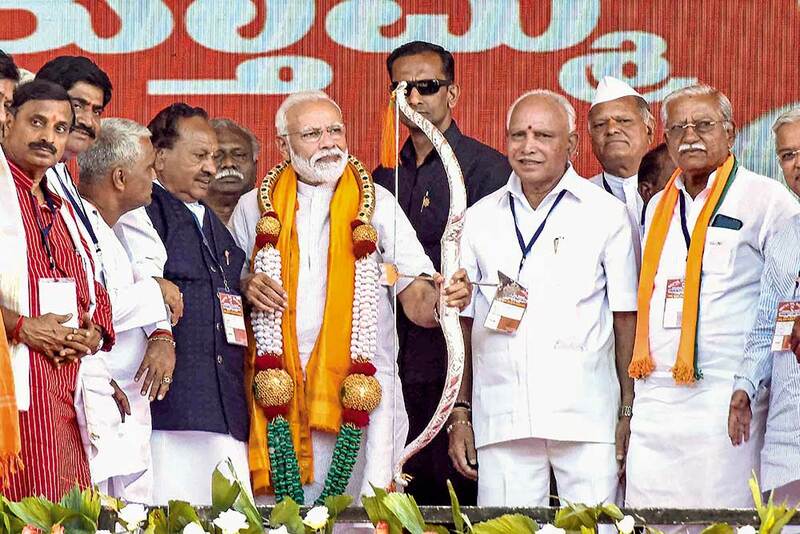 Telangana BJP leaders felicitates Prime Minister Narendra Modi during an election rally ahead of the Lok Sabha polls, in Hyderabad. 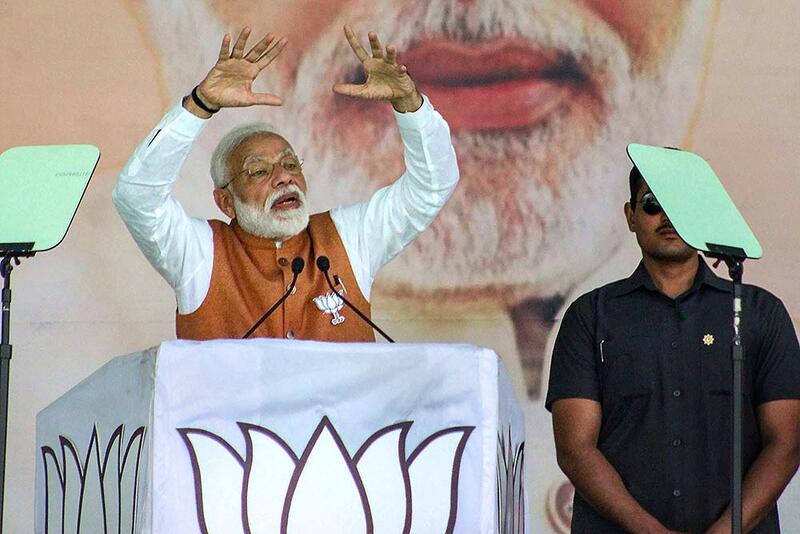 Prime Minister Narendra Modi waves at the crowd during an election rally ahead of the Lok Sabha polls, in Hyderabad. 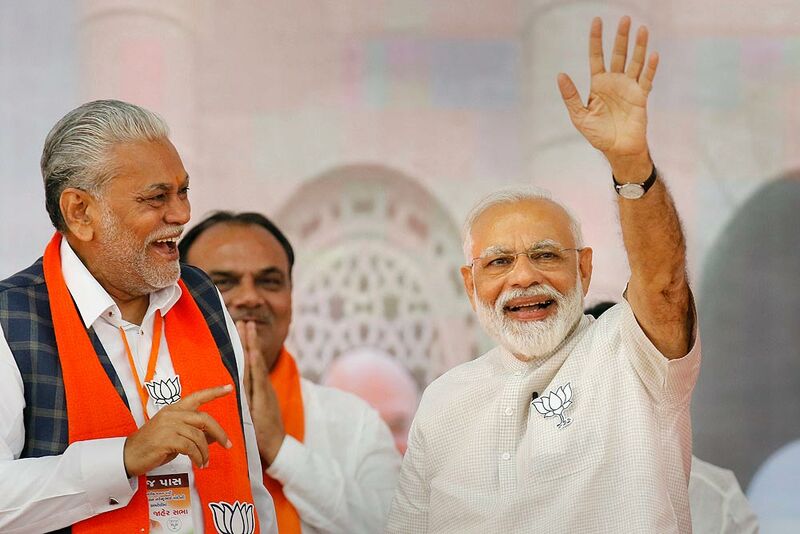 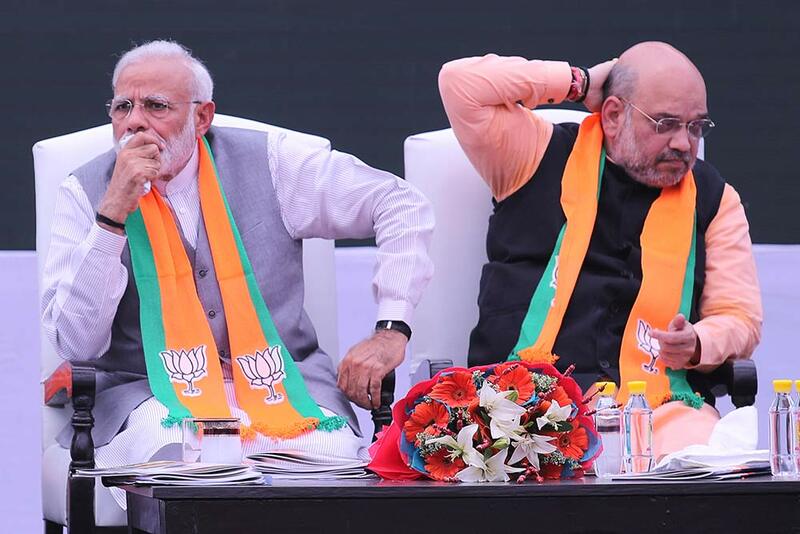 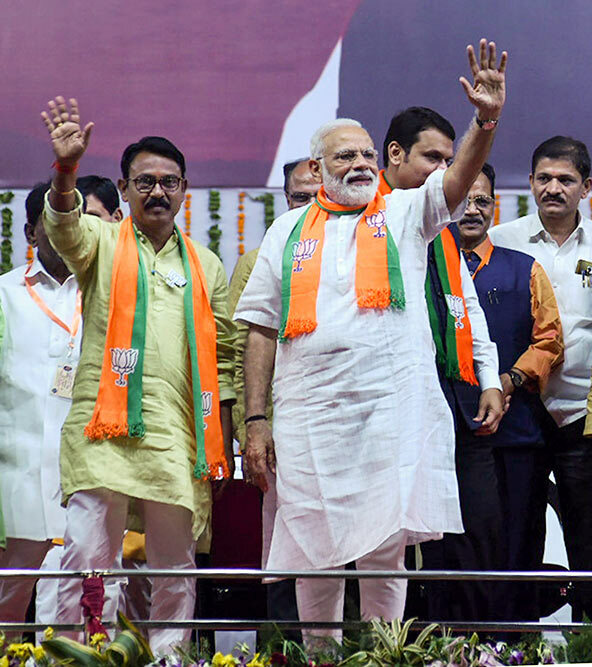 Prime Minister Narendra Modi with BJP- Shiv Sena alliance candidate from Amravati constituency Anandrao Adsul (R) during an election rally, ahead of the Lok Sabha polls, in Wardha. 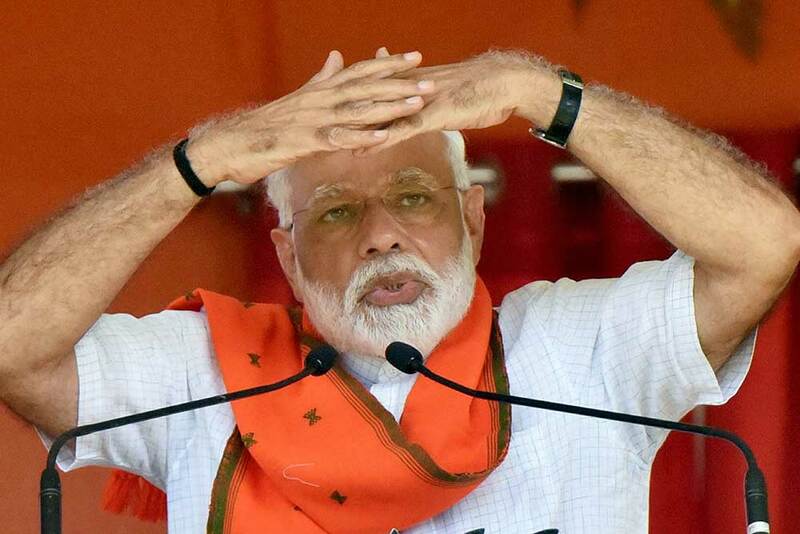 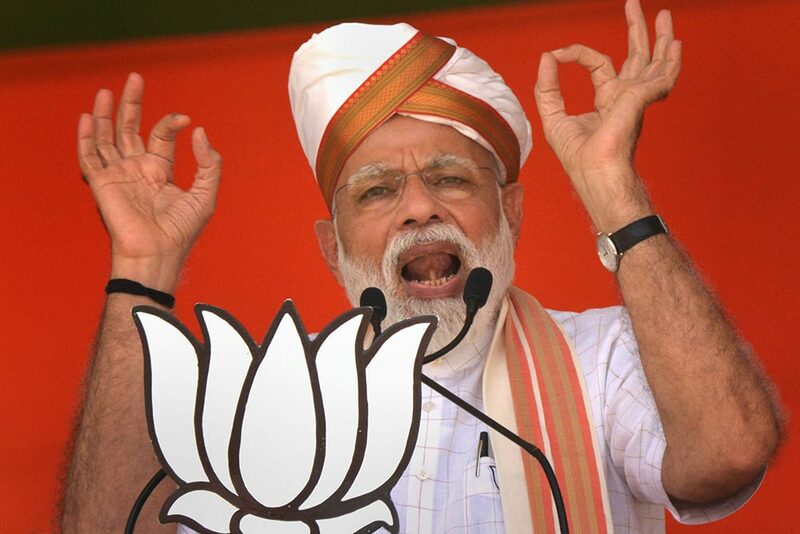 Prime Minister Narendra Modi gestures as he speaks during an election rally, ahead of Lok Sabha polls, at Aalo, in West Siang district. 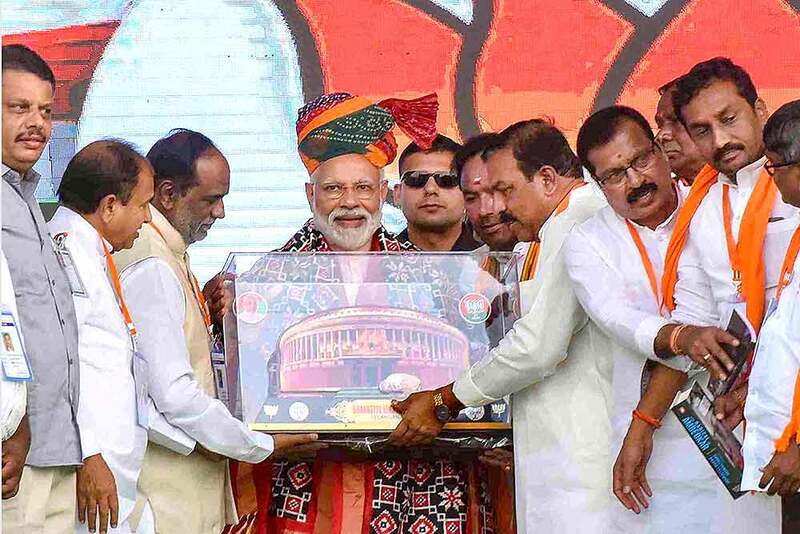 Prime Minister Narendra Modi being felicitated by party supporters during an election rally, ahead of Lok Sabha polls, at Aalo, in West Siang district. 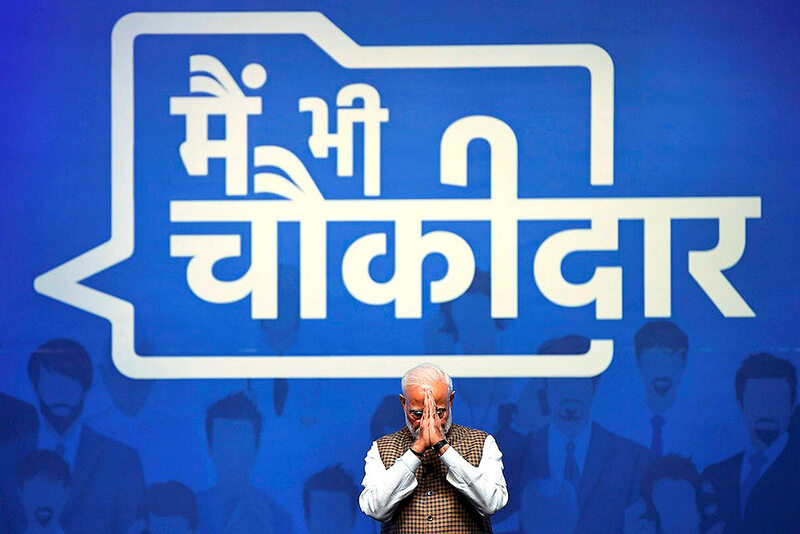 Prime Minister Narendra Modi gestures during "MainBhiChowkidar" Programme in New Delhi. 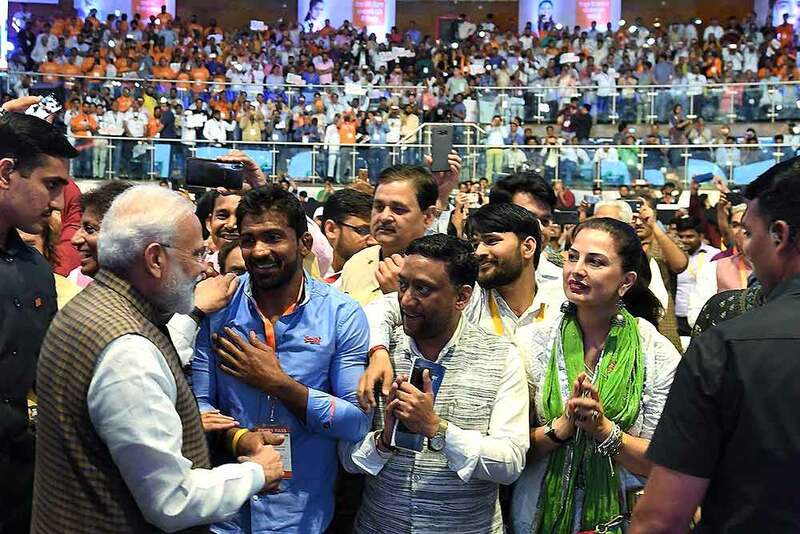 Prime Minister Narendra Modi meets people during "MainBhiChowkidar" Programme in New Delhi. 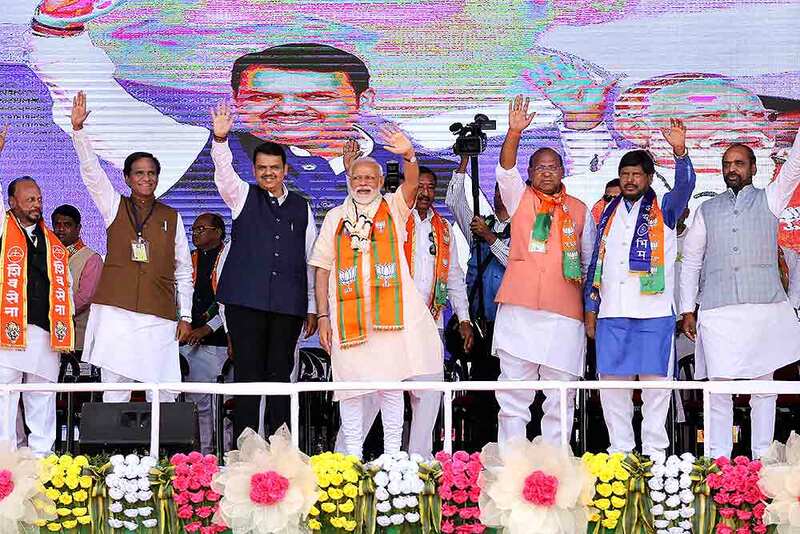 Prime Minister Narendra Modi with Chief Minister of Maharashtra Devendra Fadnavis and other leaders during an election rally, ahead of the Lok Sabha polls, in Wardha. 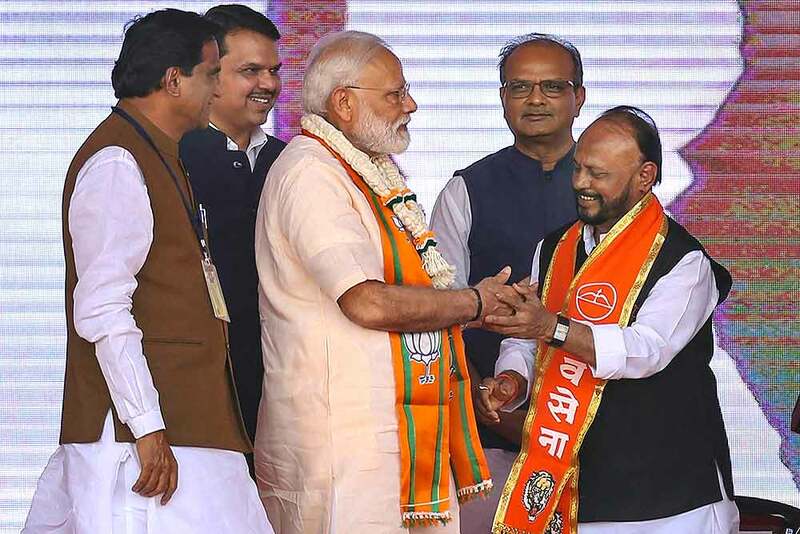 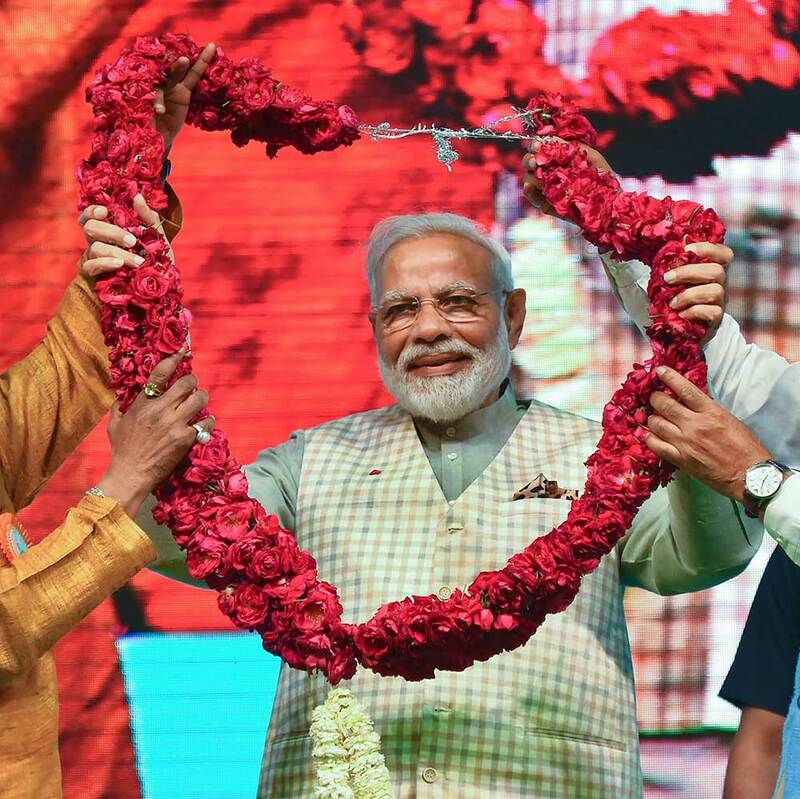 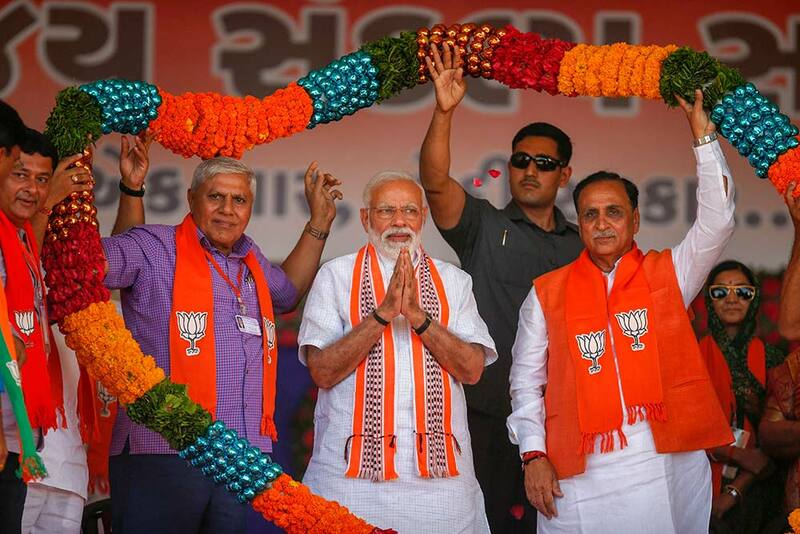 Prime Minister Narendra Modi with Chief Minister of Maharashtra Devendra Fadnavis (L) and BJP candidate from Wardha constituency Ramdas Tadas (R), during an election rally, ahead of the Lok Sabha polls, in Wardha. 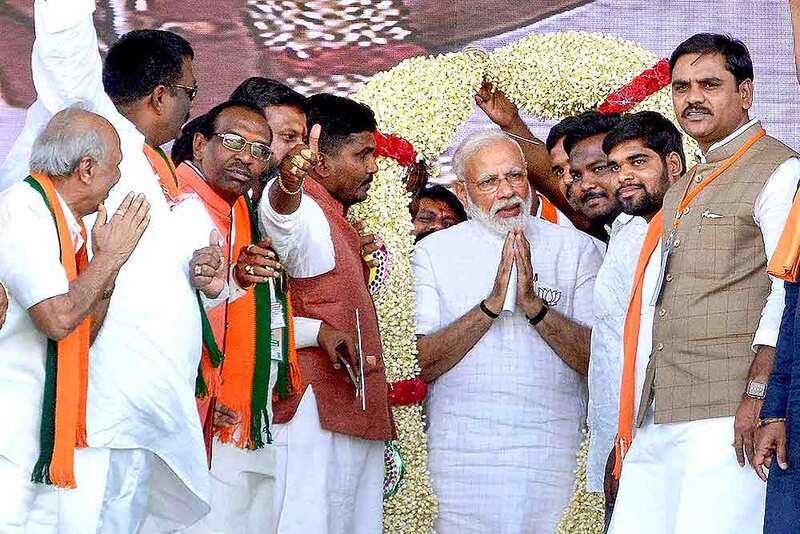 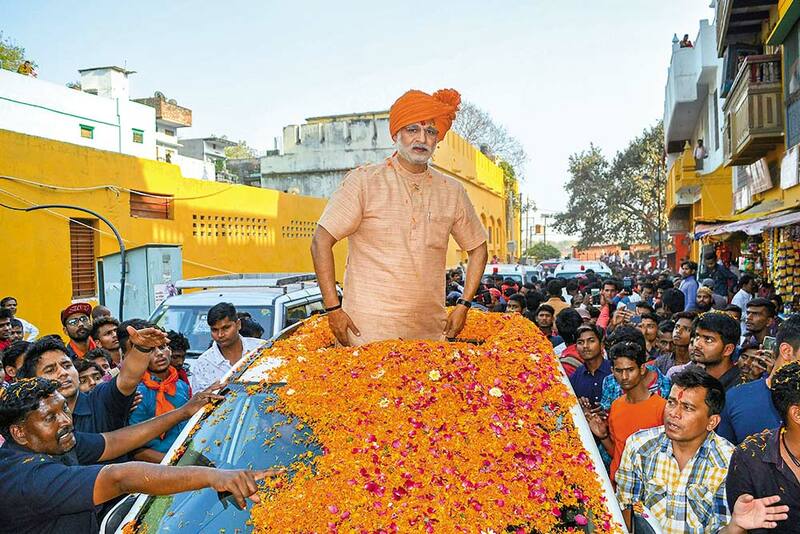 Prime Minister Narendra Modi being garlanded during a public meeting for election campaigns ahead of Lok Sabha polls, in Kurnool district of Andhra Pradesh. 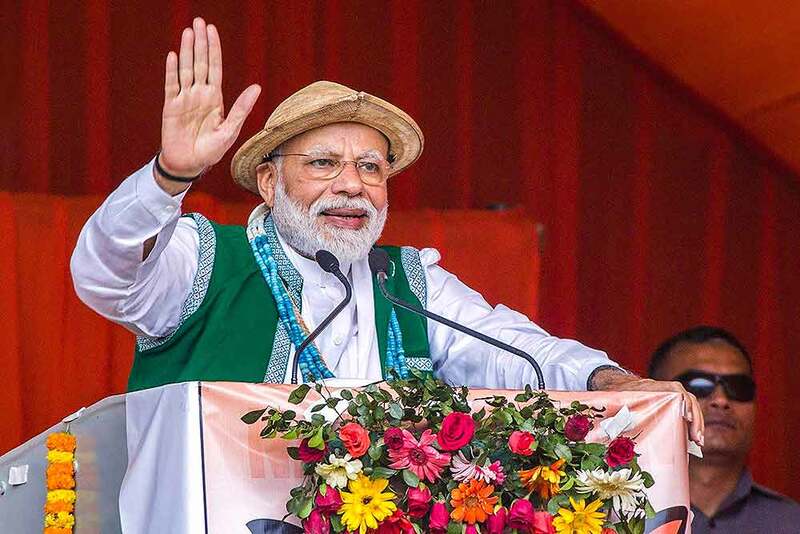 Prime Minister Narendra Modi waves at his supporters during a public rally ahead of Lok Sabha elections, at Dumi village near Jammu. 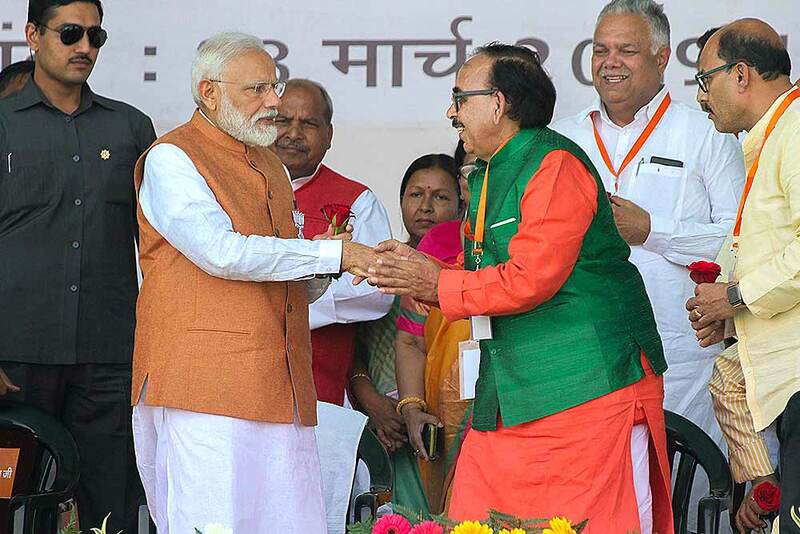 Prime Minister Narendra Modi is greeted by Uttar Pradesh BJP president Mahendra Nath Pandey during 'Vijay Sankalp Rally', ahead of Lok Sabha 2019 elections, in Meerut. 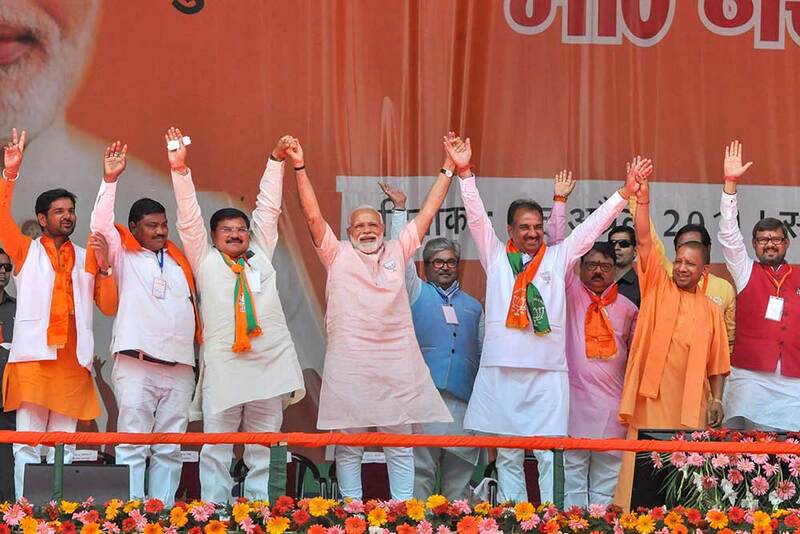 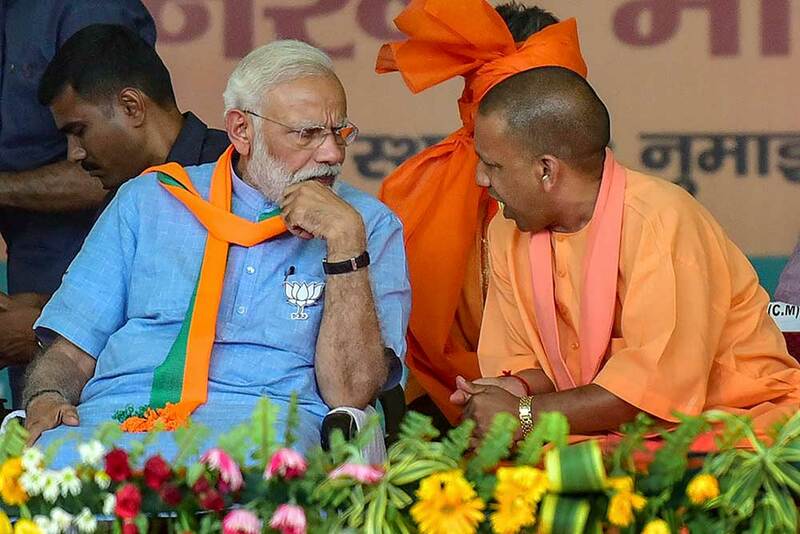 Prime Minister Narendra Modi, Uttar Pradesh Chief Minister Yogi Adityanath and other senior leaders during a rally, ahead of Lok Sabha 2019 elections, in Meerut. 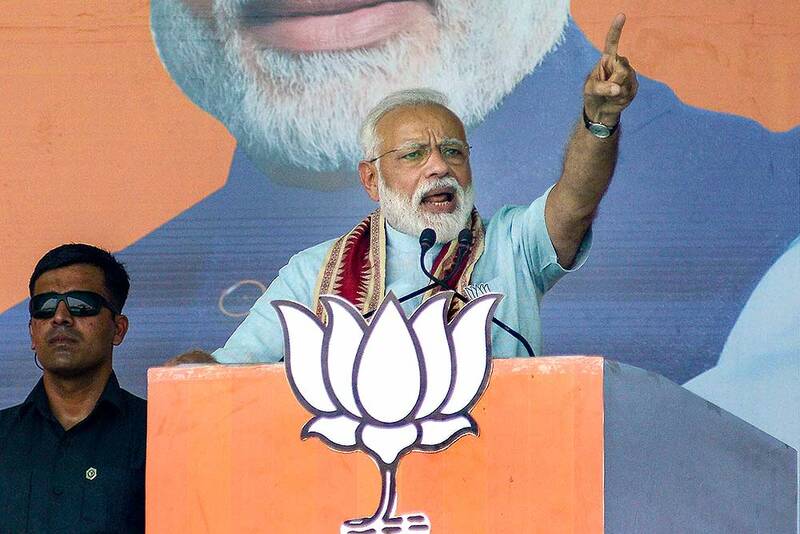 Prime Minister Narendra Modi addresses a rally, ahead of Lok Sabha 2019 elections, in Meerut. 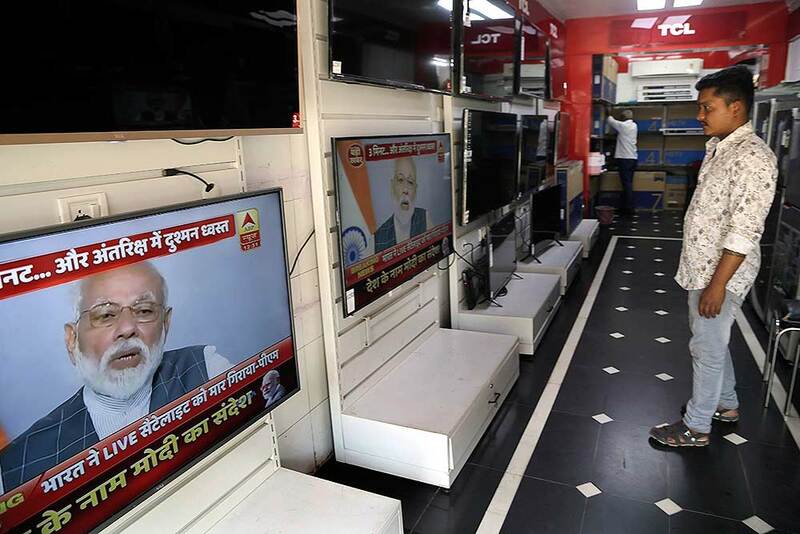 A salesman watches prime minister Narendra Modi addressing the nation on a television in Mumbai. 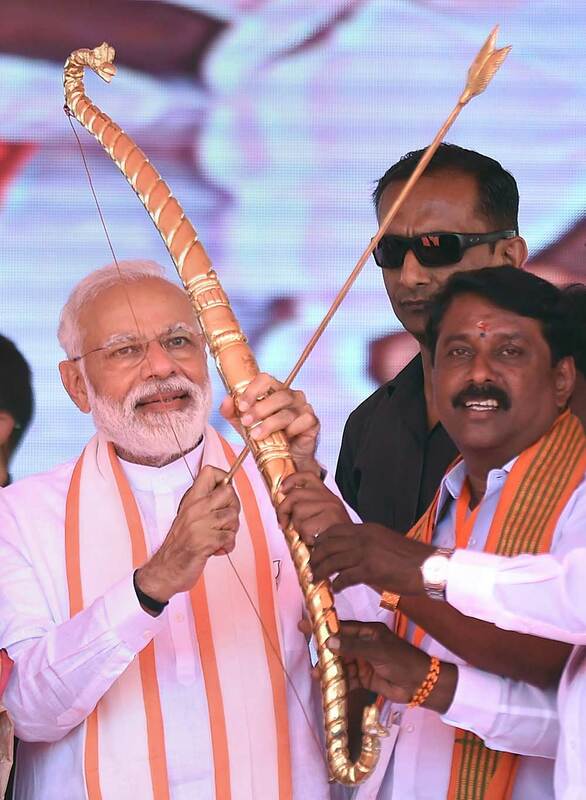 India says it has successfully tested an anti-satellite weapon in an unexpected announcement just weeks before general elections. 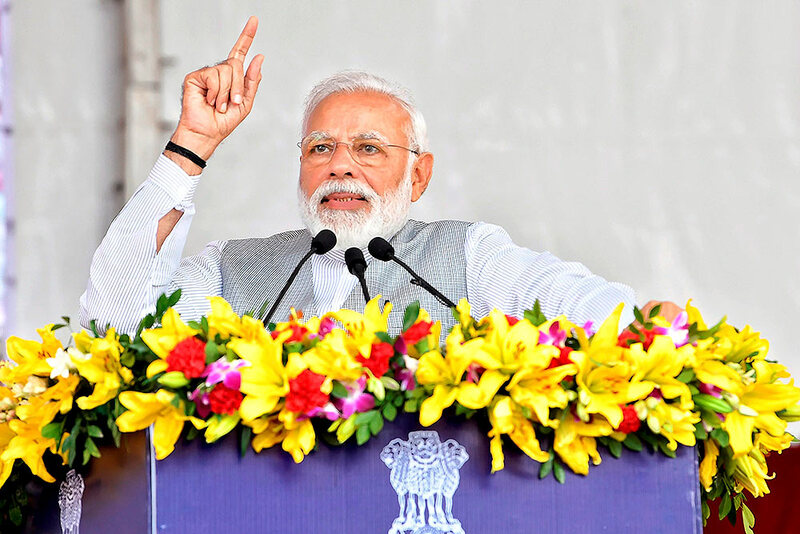 Prime Minister Narendra Modi said in an address to the nation broadcast live that Indian scientists had earlier shot down a low earth orbit satellite with a missile, demonstrating India’s capacity as a “space power” alongside the U.S., Russia and China. 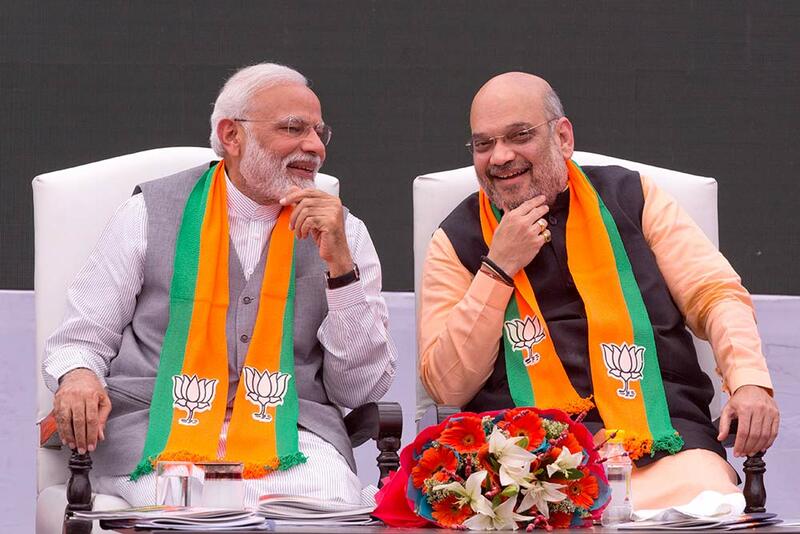 Prime Minister Narendra Modi and BJP National President Amit Shah during the BJP Central Election Committee (CEC) meeting for the upcoming Lok Sabha elections, at BJP headquarters in New Delhi. 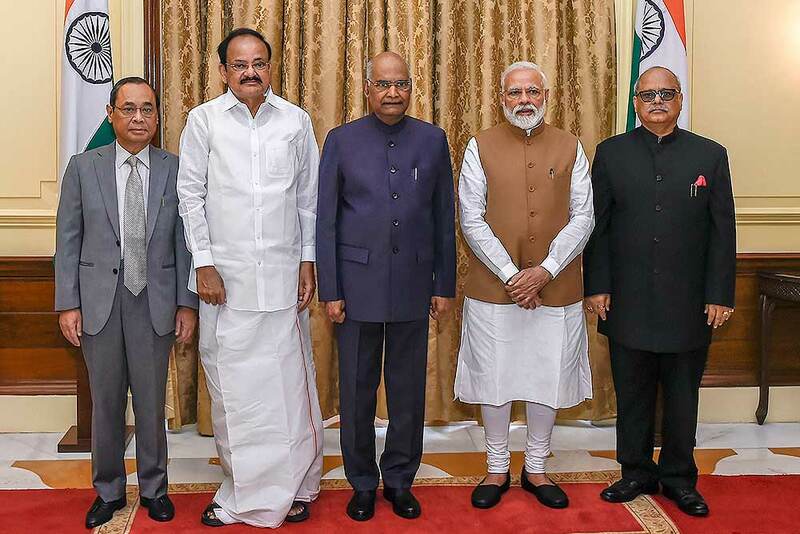 President Ram Nath Kovind, Vice President M Venkaiah Naidu, Prime Minister Narendra Modi, Chief Justice of India Justice Ranjan Gogoi during the oath ceremony of (R) Justice Pinaki Chandra Ghose as First Chairperson of Lokpal, at Rashtrapati Bhavan in New Delhi. 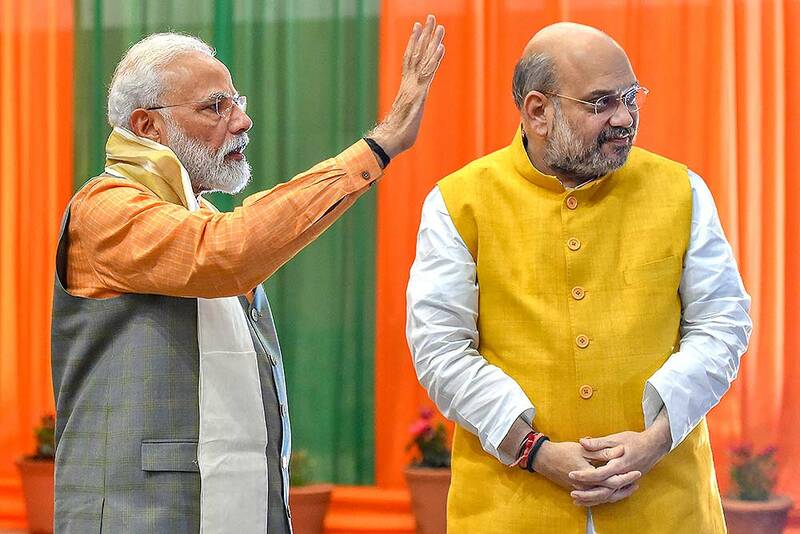 Prime Minister Narendra Modi with BJP National President Amit Shah waves at media as he arrives at the party office for Central Election Committee (CEC) meeting for the upcoming Lok Sabha elections, in New Delhi. 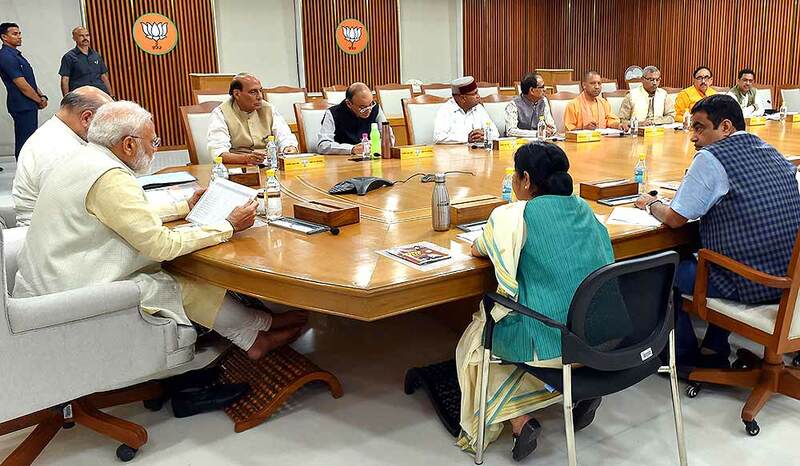 Prime Minister Narendra Modi, BJP National President Amit Shah, Rajnath Singh, Arun Jaitley, Sushma Swaraj, UP Chief Minister Yogi Adityanath and others during the BJP Central Election Committee (CEC) meeting for the upcoming Lok Sabha elections, at BJP headquarters in New Delhi. 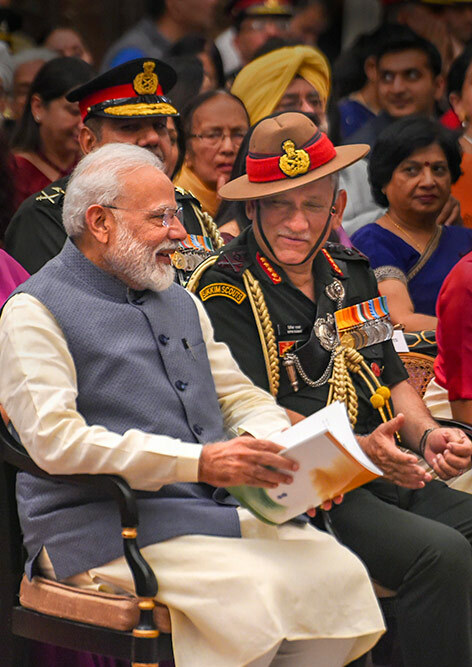 Prime Minister Narendra Modi and Chief of Army Staff Bipin Rawat at the Defence Investiture Ceremony- II, at Rashtrapati Bhawan in New Delhi. 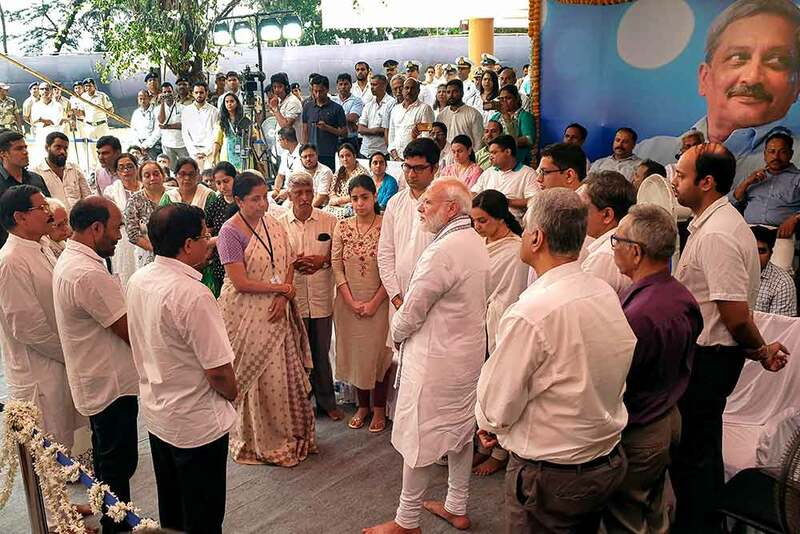 Prime Minister Narendra Modi pays condolences to the family members of Goa Chief Minister Manohar Parrikar, who passed away battling pancreatic ailment yesterday, in Panaji. 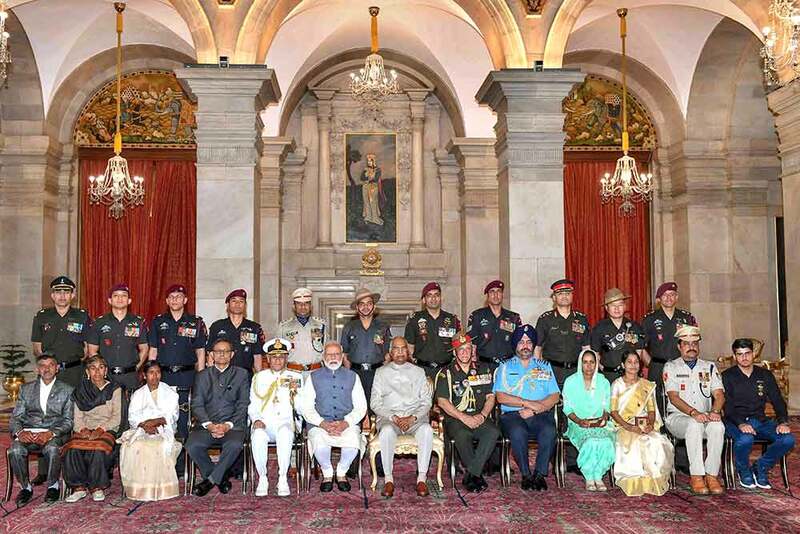 President Ram Nath Kovind, Prime Minister Narendra Modi, Chief of Army Staff Bipin Rawat, Chief of Naval Staff Admiral Sunil Lanba and Air Chief Marshal B S Dhanoa in a group photo with the recipient of gallantry awards & distinguished service decorations during Defence Investiture Ceremony-II, at Rashtrapati Bhawan in New Delhi. 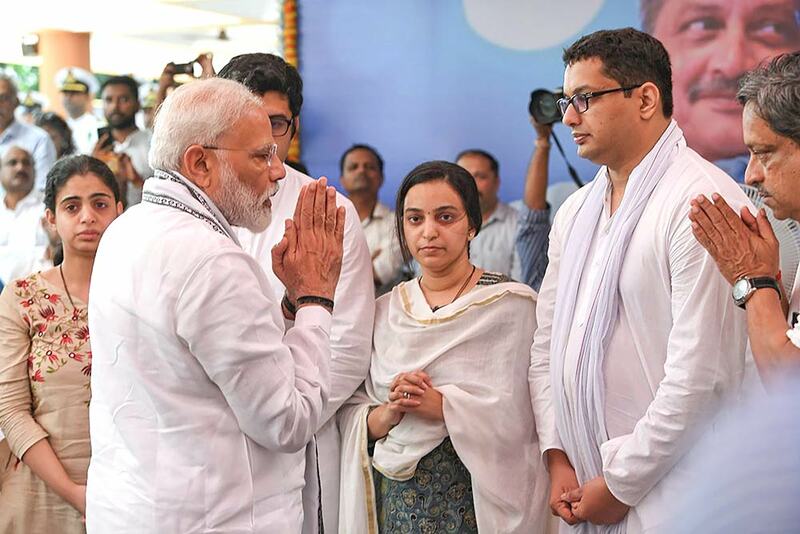 Prime Minister Narendra Modi pays condolence to the family members of Goa Chief Minister Manohar Parrikar, who passed away battling pancreatic ailment yesterday, in Panaji. 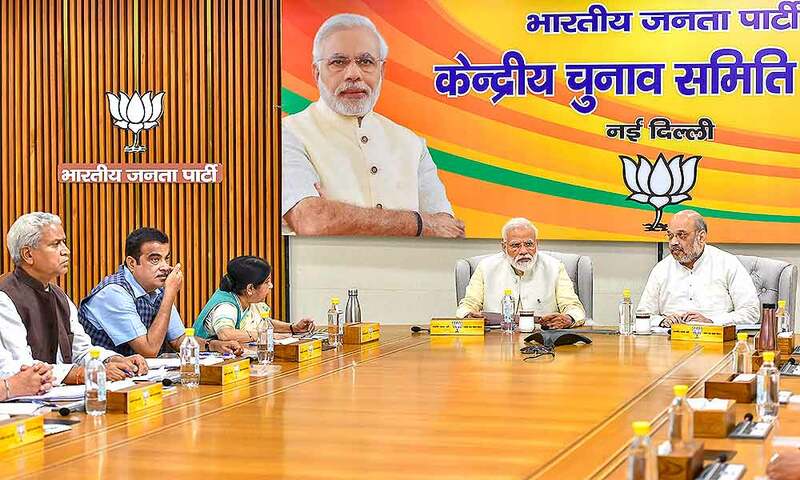 Also seen is Union Defence Minister Nirmala Sitharaman. 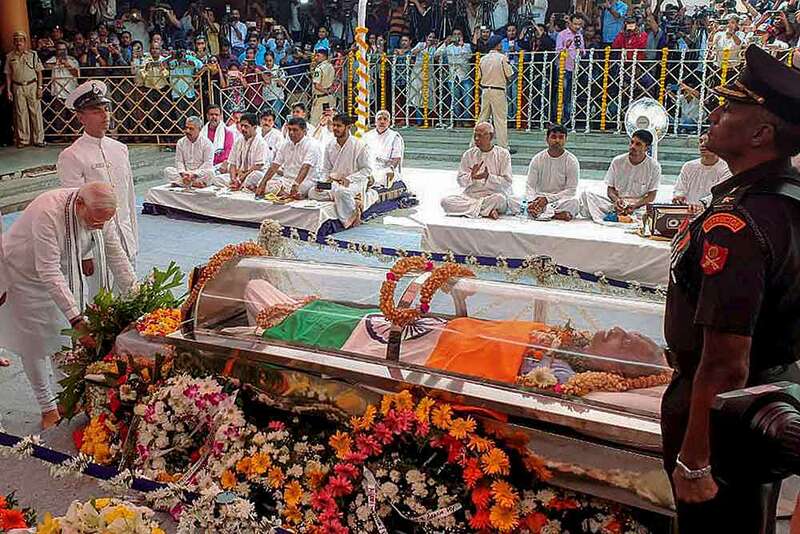 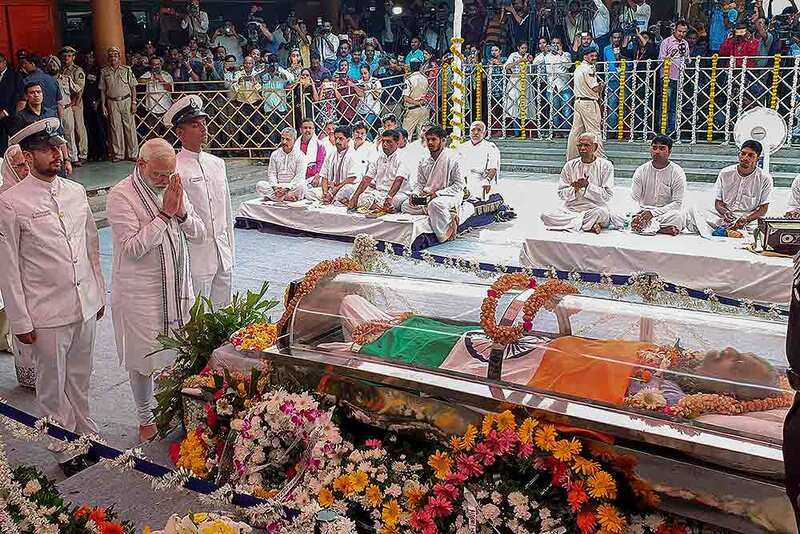 Prime Minister Narendra Modi pays homage to Goa Chief Minister Manohar Parrikar, who passed away battling pancreatic ailment yesterday, in Panaji. 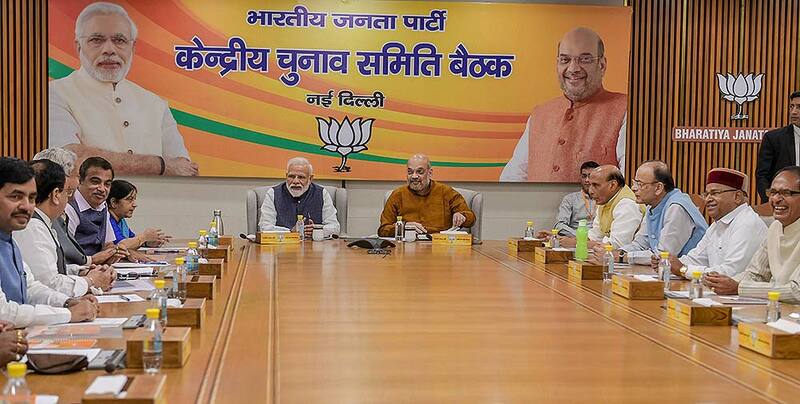 Prime Minister Narendra Modi, BJP National President Amit Shah and other leaders during the BJP Central Election Committee (CEC) meeting for the upcoming Lok Sabha elections, at BJP headquarters in New Delhi. 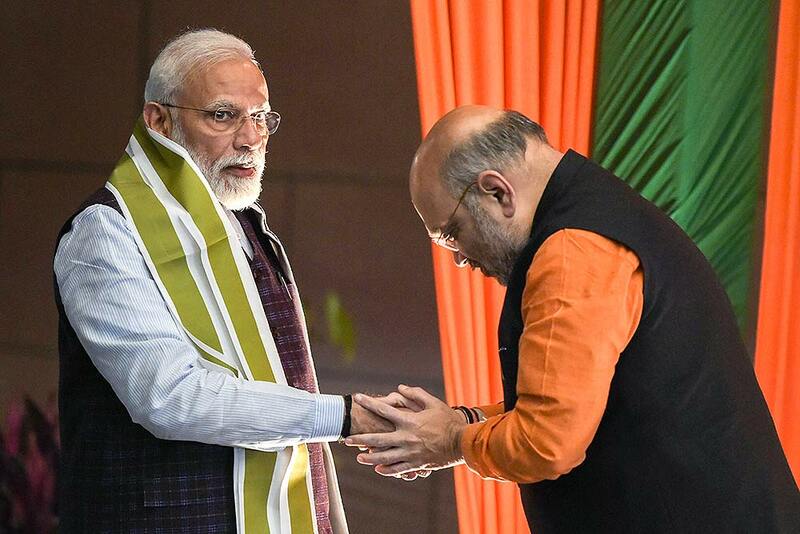 Prime Minister Narendra Modi greets BJP National President Amit Shah as he arrives to attend the BJP Central Election Committee (CEC) meeting for the upcoming Lok Sabha elections, at BJP headquarters in New Delhi. 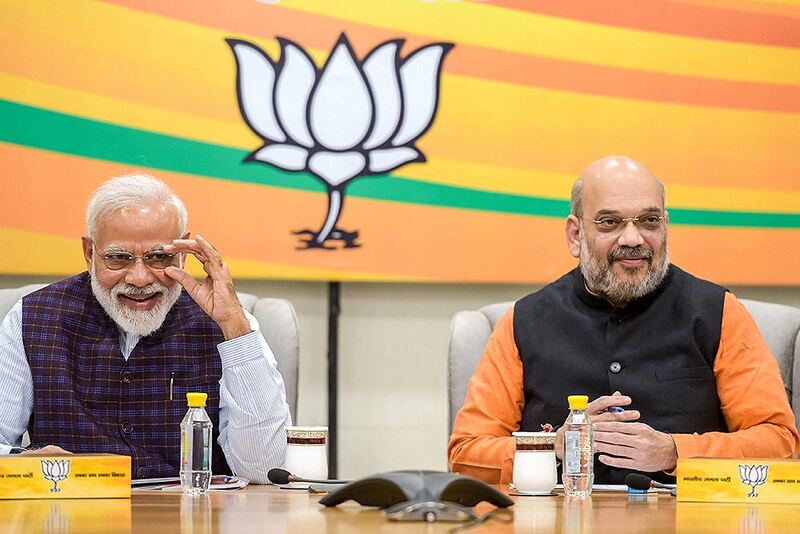 Prime Minister Narendra Modi, BJP National President Amit Shah during the BJP Central Election Committee (CEC) meeting for the upcoming Lok Sabha elections, at BJP headquarters in New Delhi. 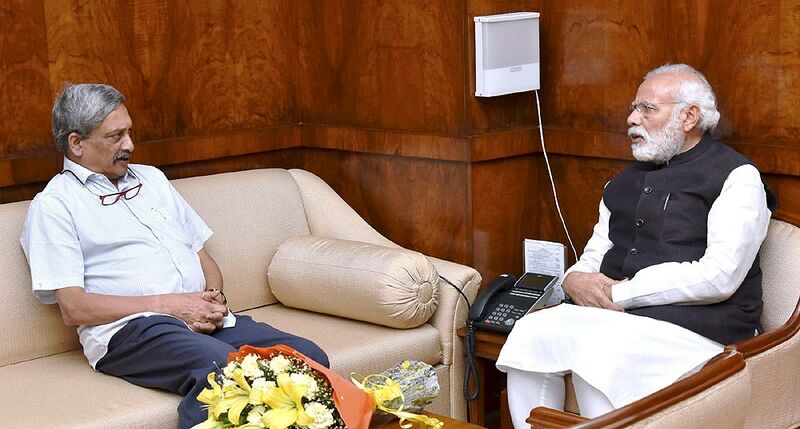 In this file photo, Prime Minister Narendra Modi with Goa Chief Minister Manohar Parrikar at a meeting, in New Delhi. 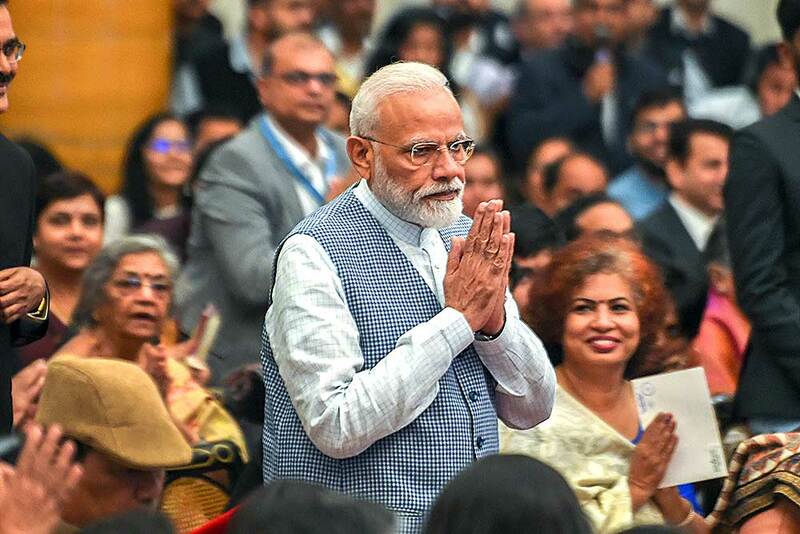 Prime Minister Narendra Modi arrives to attend 'Padma Awards 2019', in New Delhi. 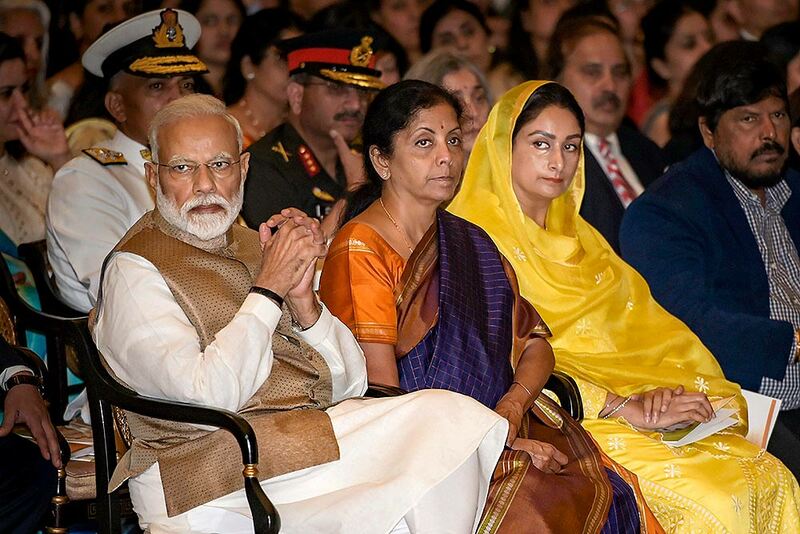 Prime Minister Narendra Modi, Union Defence Minister Nirmala Sitharaman and others during Defence Investiture Ceremony, at Rashtrapati Bhawan in New Delhi. 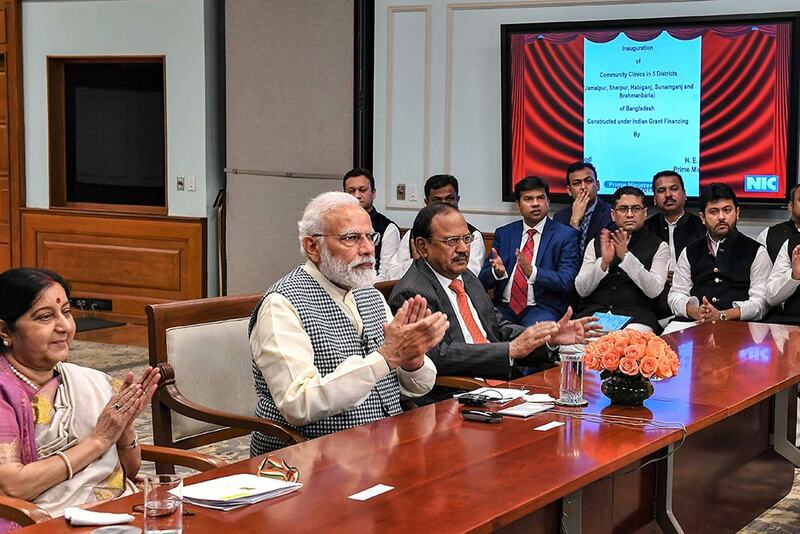 Prime Minister Narendra Modi and his Bangladesh counterpart Sheikh Hasina (unseen) jointly inaugurate development projects in Bangladesh through video conferencing, in New Delhi. 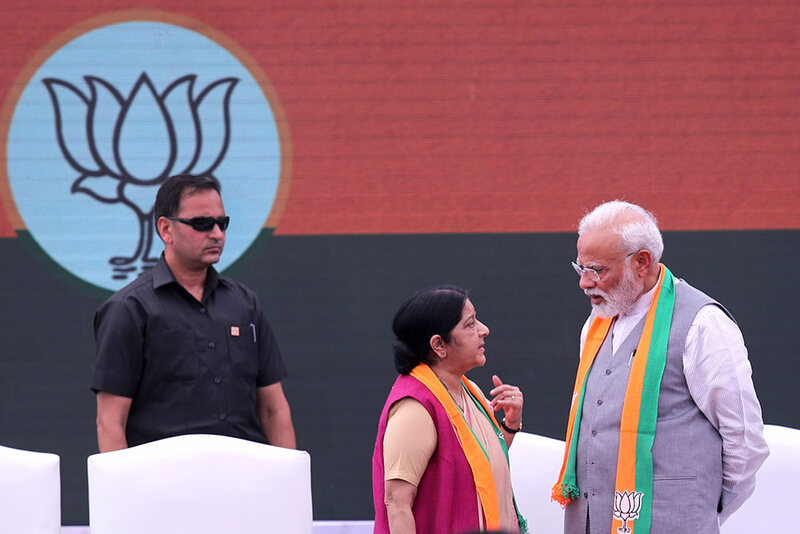 External Affairs Minister Sushma Swaraj and National Security Advisor Ajit Doval are also seen. 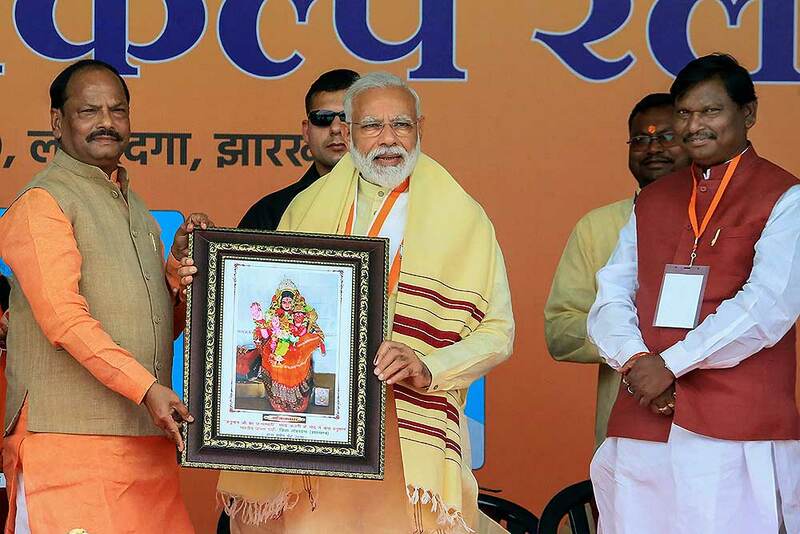 Prime Minister Narendra Modi at the inauguration of Pandit Deendayal Upadhyaya Institute of Archaeology, at Greater Noida. 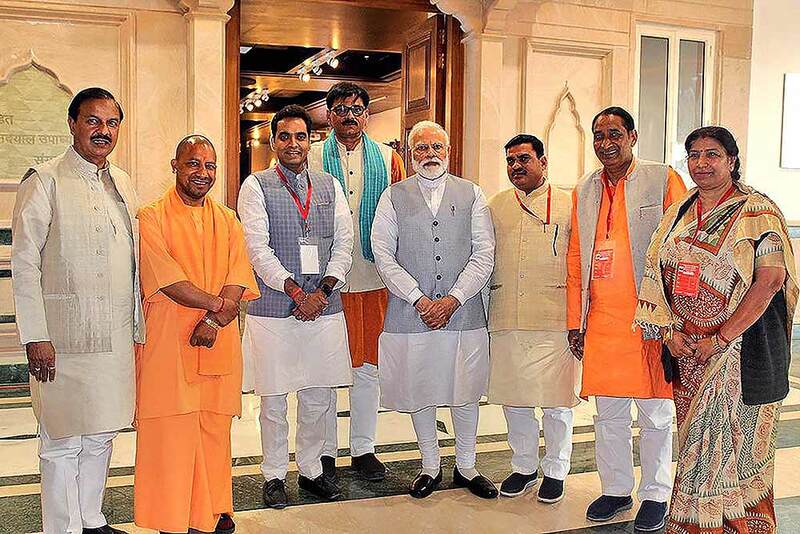 Also seen is Uttar Pradesh Chief Minister Yogi Adityanath among other dignitaries. 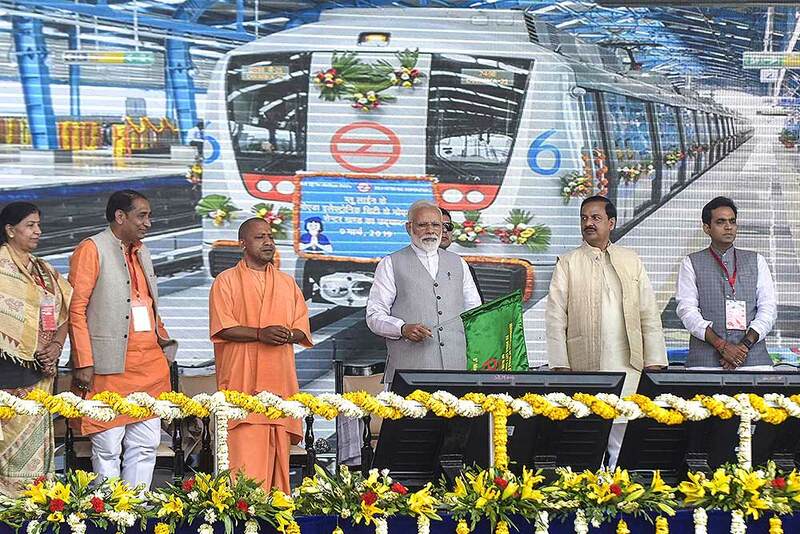 Prime Minister Narendra Modi flags off the Noida City Centre - Noida Electronic City Section of the Metro as Uttar Pradesh Chief Minister Yogi Adityanath and others look on, at Greater Noida. 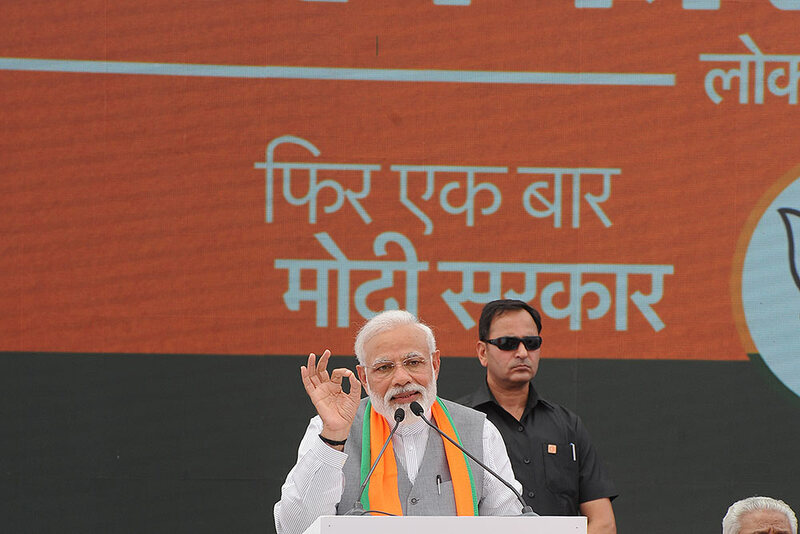 Prime Minister Narendra Modi addresses a gathering, at Greater Noida. 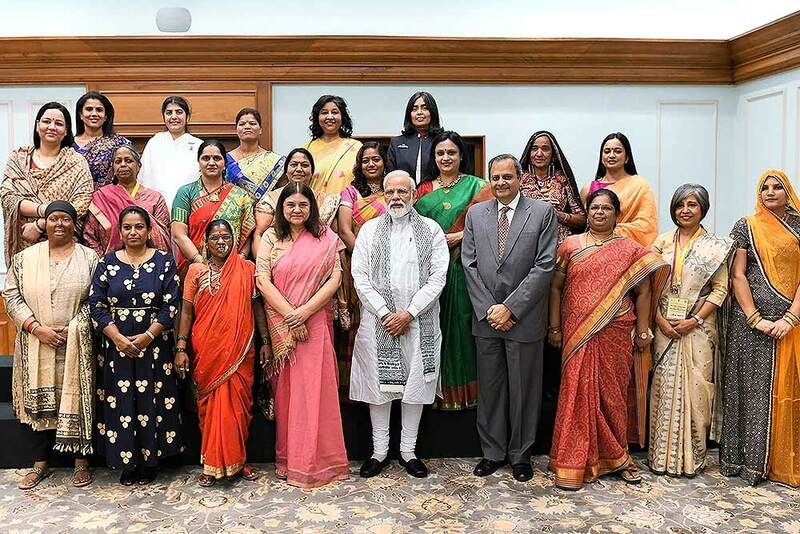 Prime Minister Narendra Modi in a group photo with the recipients of 'Nari Shakti Puraskar', in New Delhi. 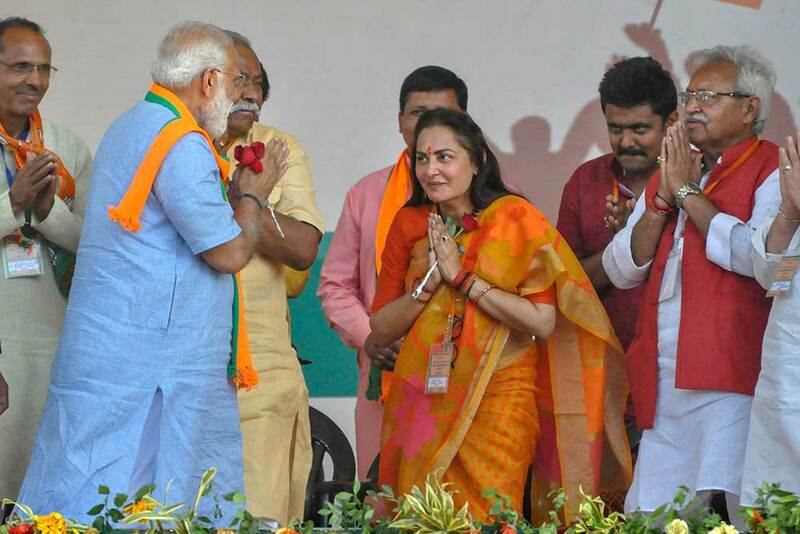 Union Minister for Women and Child Development Maneka Sanjay Gandhi and Secretary Rakesh Srivastava are also seen.